After Paris, London has also tried to have its gigantic tower! 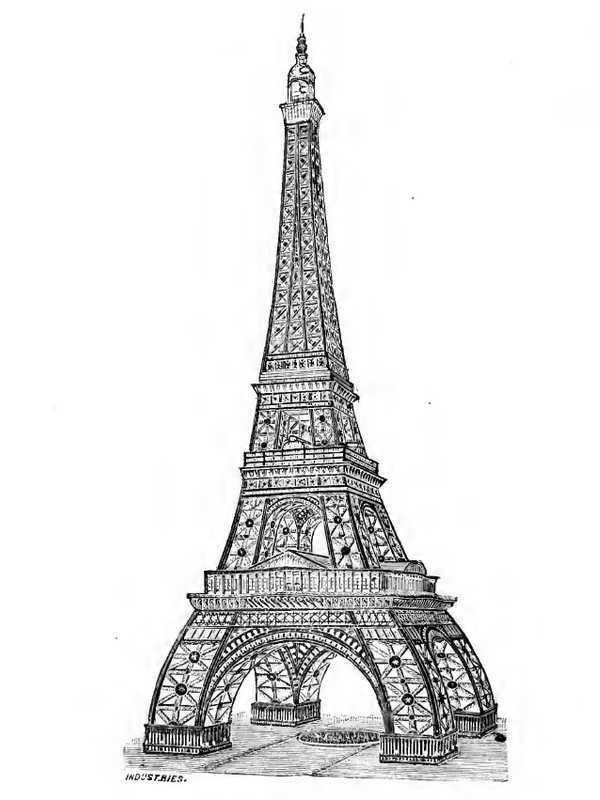 Unfortunately for the city the project launched a few years after the inauguration of the Eiffel Tower aborted, while this new tower had already arrived on the first floor. Nowadays nothing remains of the construction site, old, it is true, of more than a century. Here is how this construction took place, for that, let's start with the origin of the London project. 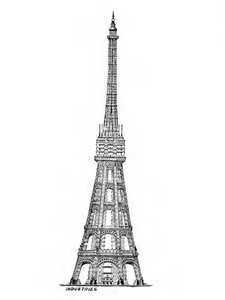 Once built the Eiffel Tower has forced the admiration of the whole world. During the World Fair of 1889 there was a large number of visitors who climbed the floors of this strange tower planted in the heart of Paris. Among them, many personalities , including most of the crowned heads of Europe and even the whole world. One can imagine that such a success has made envy, or maybe some have considered the tower as the launch of a giant contest of the country that would manage to make the highest tower. 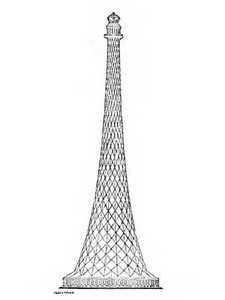 The fact remains that Mr Edouard Watkin, an English construction contractor and with his staff Benjamin Baker, famous builder of the Forth Bridge, decided to launch his own competition to build a tower in London rivaling the Eiffel Tower. The first prize was 500 guineas, or 12,500 francs at the time, and the second prize of 250 guineas, or 6250 francs. 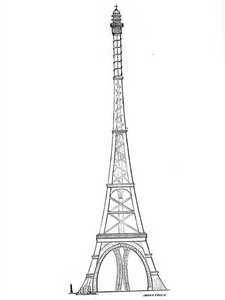 In the specifications it was stipulated that the tower should measure at least 1200 feet, or 366m. There were also constraints, like the maximum tension of the steel (if it was used, which was not imposed). There were 68 proposed projects, most of which were particularly zany. 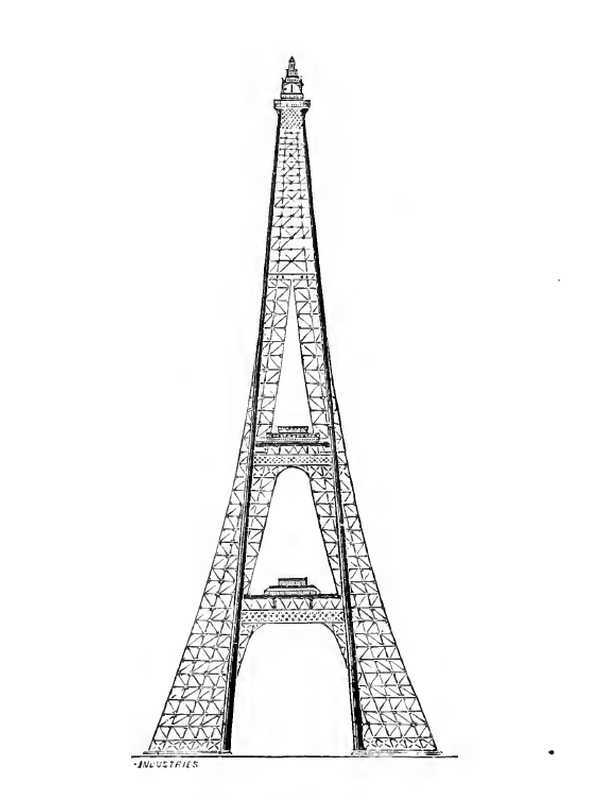 The first prize went to Stewart, McLaren and Dunn for their sharper steel tower than the Eiffel Tower, a 1,200-foot tower at 14,659 tonnes at a price of £ 352,222. But it was without much conviction that the jury delivered its verdict, the chief architect of the competition not believing too much in the realization of any of these 68 projects. The winner is No. 37 in the list below, the second prize having been awarded to project No. 51. First of all, here is the presentation text of the contest. It's a translation because the original text is in English, of course. 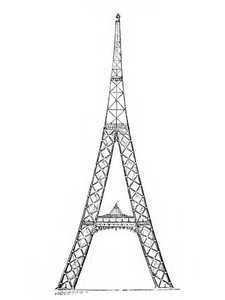 He takes advantage of the Eiffel Tower and offers to do the same in London. 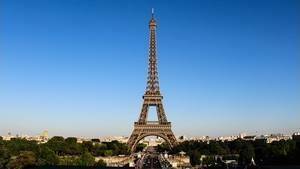 One of the most interesting places in Paris is the Eiffel Tower, which is located at Champ de Mars. It was designed by the eminent French engineer, Gustave Eiffel, and is the most remarkable feature of the 1889 French Exhibition. The construction of the tower used 7,500 tonnes of steel and iron, consisting of 12,000 specially designed pieces, fixed together with 2,500,000 rivets, the number of drilled holes being 7,000,000. The height of the Eiffel Tower is 300 meters, or 984.26 feet above the ground. The cost was £ 280,000. 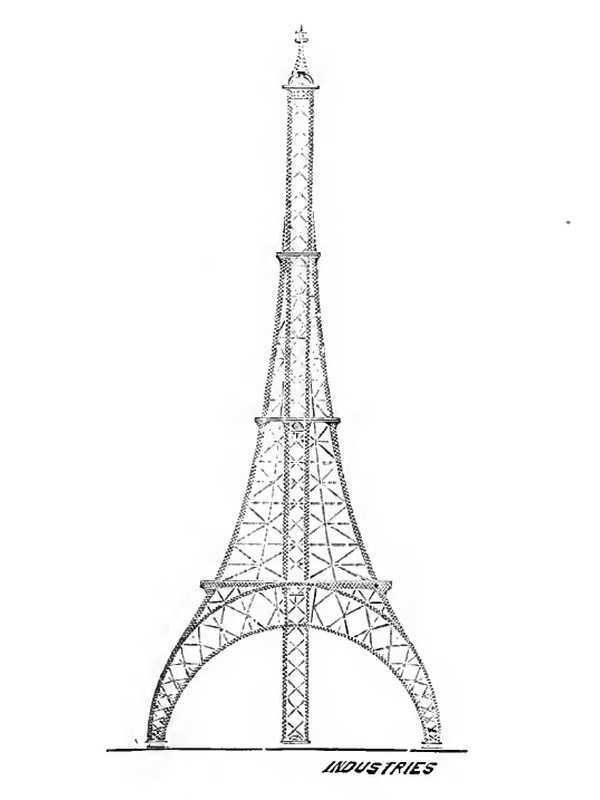 The graceful shape of the Eiffel Tower was determined not only by aesthetic considerations, but by mathematical considerations depending on climatic conditions and the intensity of the wind. It rests on its four-foot foundations, each of which consists of four main beams, braced together by lattice girders and ties. The structure is based on sixteen main frames, four out of each foot. By this means, the total weight of the Tower is distributed over a large area, which reduces the pressure per square foot on the foundations. In fact, the foundations are loaded with no more weight than those of an ordinary five-story building. 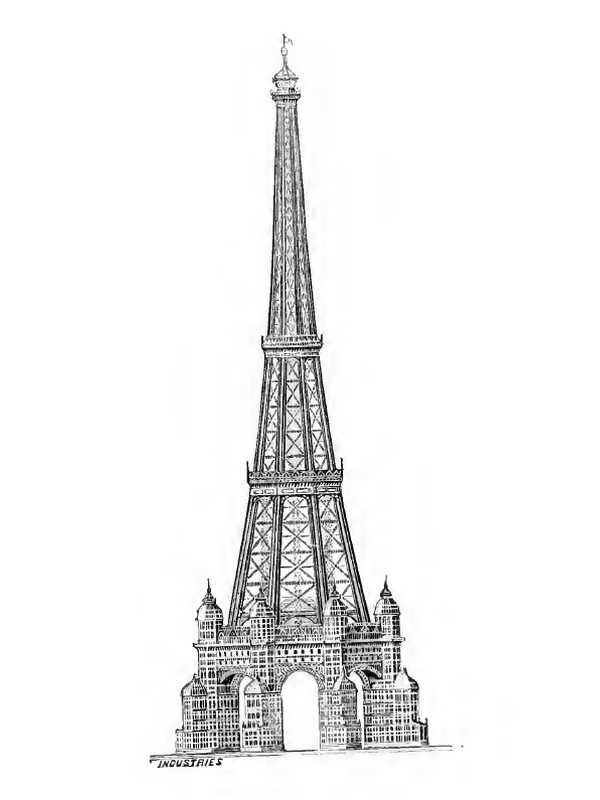 The project for the construction of the Eiffel Tower was attacked with a lot of animosity, as is usually the case with the novelties, but the large amount of public patronage it continues to receive proves that this opposition was unfounded. 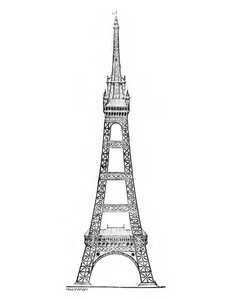 The popularity of the Eiffel Tower can be measured by the revenue it rakes. 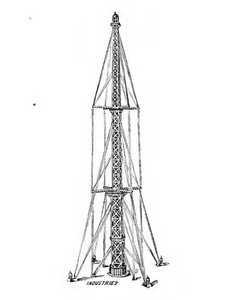 During the show the net revenue on the Tower was £ 260,000, a sum almost equal to its cost. From the period when the Tower was opened, until the closing of the exhibition, the average weekly receipts of entry fees alone (excluding commercial rents and profits from restaurants and other sources) to £ 1,148, despite very unfavorable weather. Revenues from shops, restaurants, concerts, etc., are expected to increase significantly the weekly average, leaving a huge profit on spending. 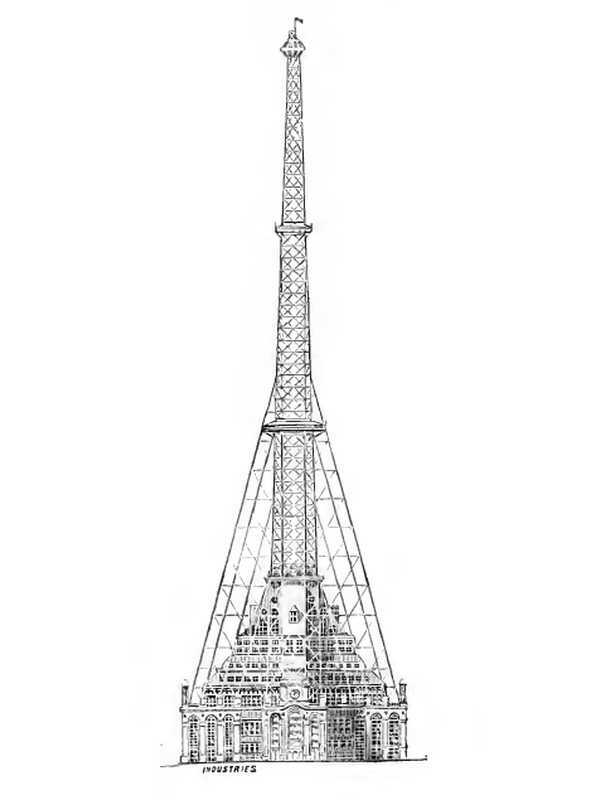 The Eiffel Tower has already rendered valuable services to science, providing special opportunities for observation and research, which, because of its altitude, are not otherwise attainable. 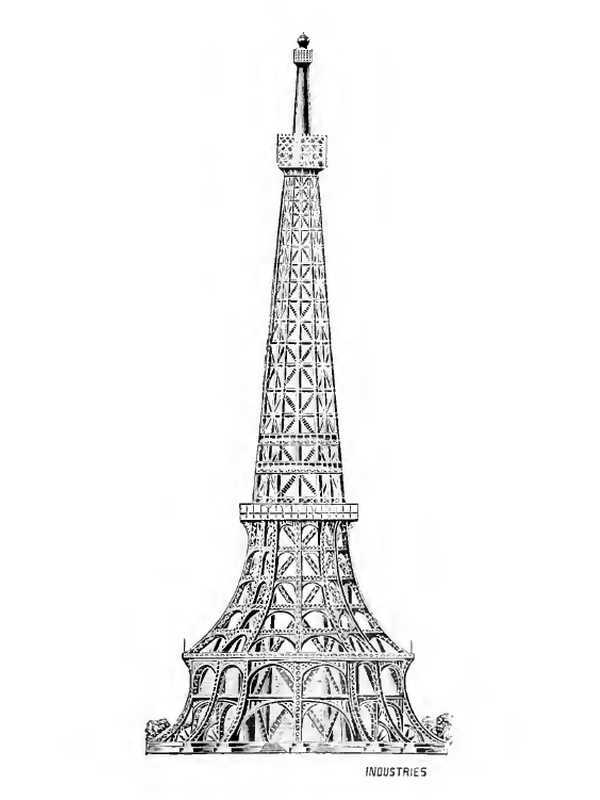 Taking into consideration the tremendous popularity of the Eiffel Tower and the resulting pecuniary benefits conferred to those interested in this venture, it is not too much to expect that, within a short time, all major countries will possess their own turns. The project of a big tour in London will soon find the enthusiastic support of many companies. A company was created, namely: "The Tower Company Limited", the promoters being the following gentlemen: Sir Edward W. Watkin, Bart, MP, EH Carbutt, Esq, Mr. Inst ... CE, William MEWBURN, Esq., Captain Francis Pavy, RW Perks, Esq., Henry D. Pochin, Esq., JP, and the end of TA Walker, Esq., Entrepreneur for the Manchester Ship Canal, Severn Tunnel, and others works. The first step of the project is to invite designers to propose works that will be subject to competition. Two prizes are offered, worth 500 guineas and 250 guineas. The response to these calls resulted in sixty-eight drawings and suggestions, some of which came from the United States, Germany, Australia, Sweden, Italy, Austria, Turkey and from Canada. The great public interest in the exhibition of the drawings prompted the promoters to publish their works, engraved in a book on a scale reduced from 300 feet to an inch. To rule on the merits of the projects, a jury committee was appointed, among which were Sir Frederick Bramwell, Sir Benjamin Baker, Sir Edward J. Harland, MP, Mr. JF Moulton, QC, Professor Alex. BW Kennedy, Mr. Charles Liddell, EC, Mr. Verity, and Mr. EH Carbutt, Chair. After a very careful review, the first prize of 500 Guineas was awarded to MM. AD Stewart, JM McLaren and W. Dunn of London, and the second prize of 250 Guineas was acquired by MM. JJ Webster and W. Haigh of Liverpool. The jurors honored Mr. Max am Ende's design, and expressed a high opinion of the ingenuity displayed in most other models. 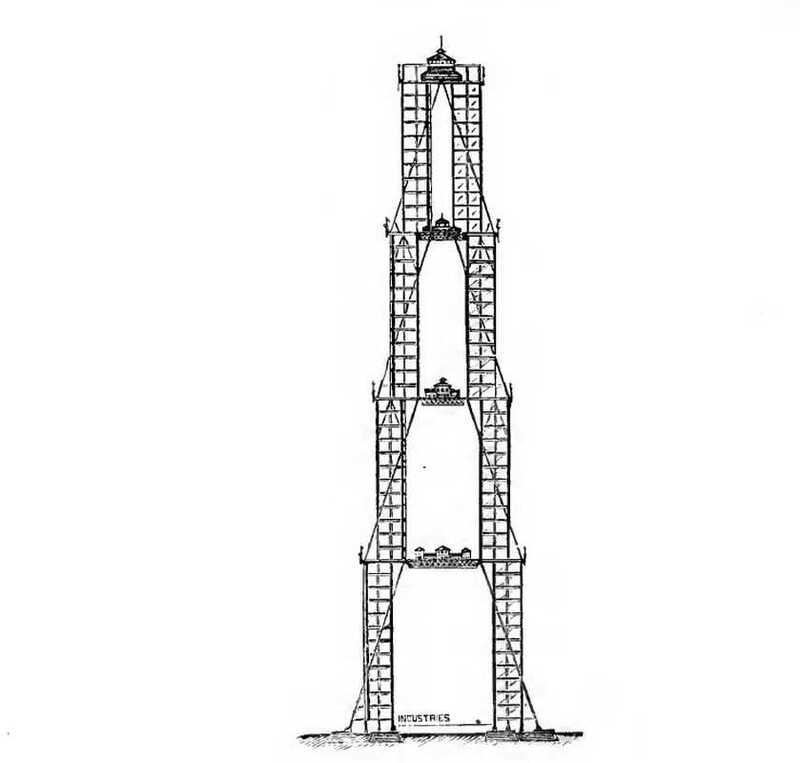 Sir Benjamin Baker has agreed to become a project engineer, and with his extensive engineering background, will know how to make The tower blameless, not only as an engineering structure, but also as a public utility. 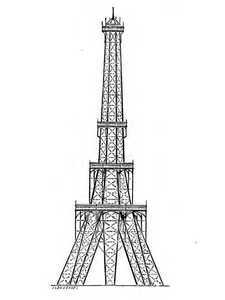 The tower will be much more spacious and taller than the Eiffel Tower, to be even more useful, and to accommodate a larger audience. The special equipment for epicureans will be provided, such as restaurants, theater, shops, Turkish baths, walks, winter gardens, and a variety of other amusements, which will not only allow healthy recreation for the public but also a return significant investment for shareholders. The Tower will be equipped with elevators, and on the upper floor there will be an observatory and rooms for scientific experiments, which will be a very interesting feature of this business. 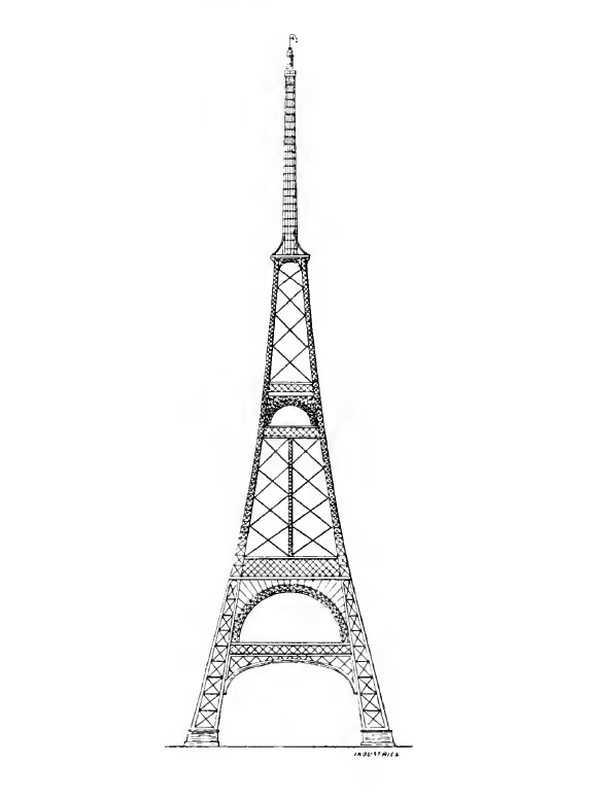 Experiments in signage have already been made on the Eiffel Tower, with the result that it has been successfully completed at a distance of 75 miles. From observations to the recording of the intensity and direction of the wind under varying conditions, the micrographic study of the air, and the question of the existence of bacilli; in some pure and rarefied vectors, are just some of the important investigations that should be demonstrated. The astronomical observations of this immense height, with such purity of the air, and the freedom of fog, will extend our knowledge of this branch of science, and make the meteorological photography more perfect. Doctors in Paris have already discovered the benefits that can be gained by patients with pneumonia and throat affections, and many patients, under their guidance, have made use of the "clean air cure" on the Eiffel tower with very beneficial results. 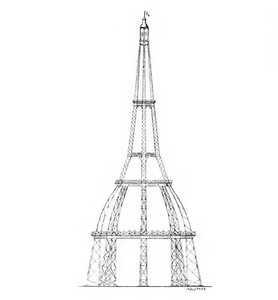 So the tower can be used in the idea of ​​improving the suffering humanity. 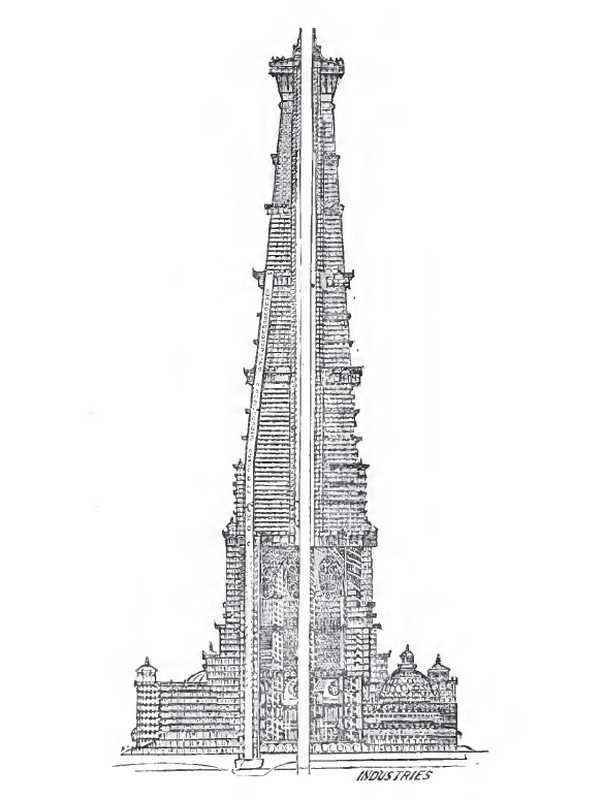 Many sites have been suggested as appropriate for the Tower, but these are the highlands between Willesden and Harrow at Wembly Parle, which have been selected (subject to re-examination). They consist of a 280-acre estate, of which 150 can be used for the use of the Tower and the surrounding park. 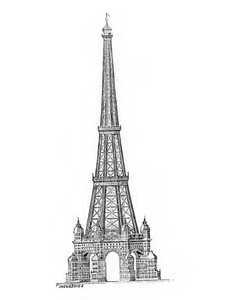 This tower would be held at a considerable elevation while in the case of the Eiffel Tower, it is at the level of the Seine. The natural beauty of this well-wooded country, and the ease of access (being only 12 minutes from Baker Street by train), make this site desirable, especially as the Metropolitan Railway runs through, and that this company is building a special resort for visitor accommodation. 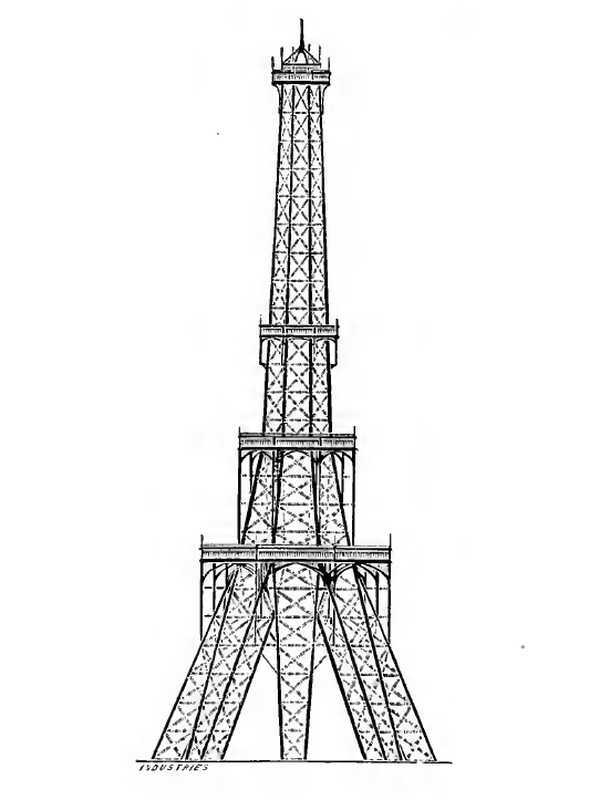 The following is a translated reproduction of the tower specifications, issued by the developers, on November 1, 1889. Article 1. The designer will have to make sure that the foundations are perfect (ie, sand, stone, hard clay, or gravel) and he will have he is responsible for estimating the consequences of his work. 2. The structure must be designed to withstand wind pressure, the most sudden storms and to be protected from lightning. The material preferred is steel, but the designer should not be limited to its use, he can use the material of his choice. The designer can consider, if the steel is used, stability, under a maximum wind pressure of 5 lbs per square foot, the tension on the steel not to exceed 74 tons per square inch, and under a presumed pressure of twice that amount, the structure must be stable as a whole. 4. 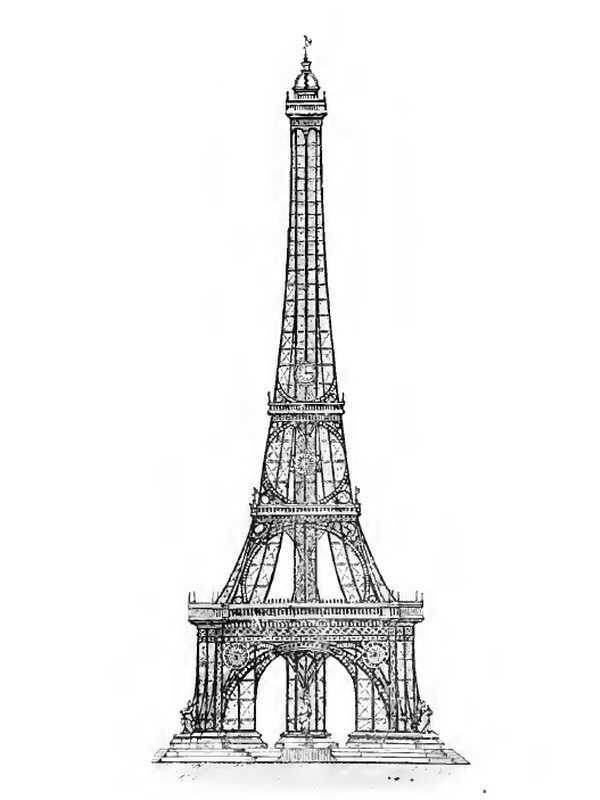 The tower must be divided into a number of floors that the designer thinks best fit for its construction, while giving sufficient space to ground, and each of these floors must be able to support the weight of restaurants, offices, and other buildings. Elevators must be completed by stairs. 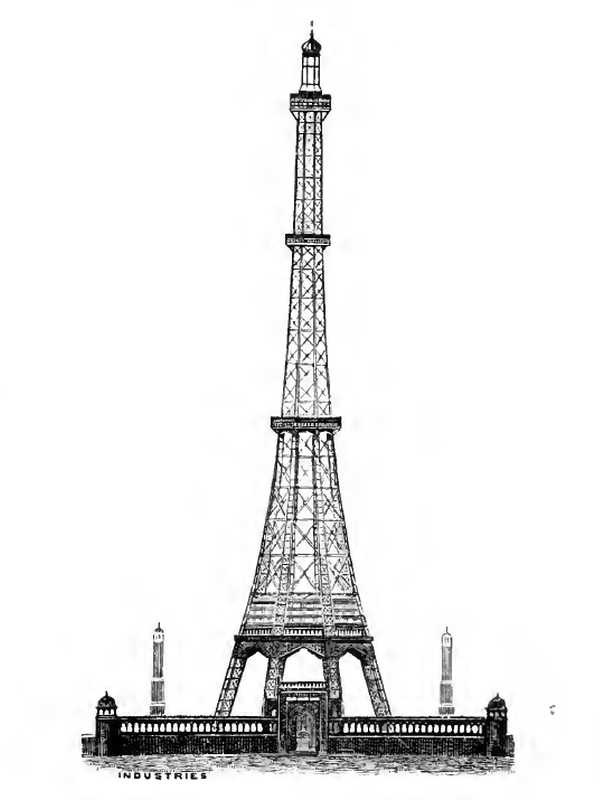 For information, the Eiffel Tower has two "Roux" lifts that rise up to the first platform, capable of raising 2,400 visitors per hour, plus two "Otis" elevators that together make 800 visitors per hour; and an elevator "Edoux" which climbs from the second to the third platform, has a rate of 800 visitors per hour. 5. Arrangements must be made for electric lighting, etc. 6. These suggestions are only intended to give the contours of the project, the designers have all the freedom necessary for their imaginations. c. The cost of labor and construction supervision. 8. The drawings and estimates are open to all competitors, and must be sent no later than the end of February. Foreign competitors will have a little more time, if necessary. Any request will be considered with kindness. Sir Frederick BRAMWELL, F.R.S., M.Inst.C.E. Sir Edward HARLAND. Bart, M. P.
PROF. ALEX. B. W. KENNEDY, F.R.S., M.Inst.C.E. JF Moulton, Esq., QC. FRS, Assoc.Inst.CE, T.A., WALKER, Esq, Assoc.Inst.CE THOMAS Verity, Esq., F.R.I B.A., F.O.L. E. H. Carbutt, M.Inst.C.E., President. The jury has the power to add the necessary skills by adding a member at any time. 10. The drawings will be displayed to the public (with or without the name and address of the designer, who may decide) in London before or after the arbitration. The projects submitted to the competition have a wide variety of merits, and although each of them has excellent parts, we must admit that the whole contest was a real disappointment for us, and that there is not a single project that we can recommend for execution. 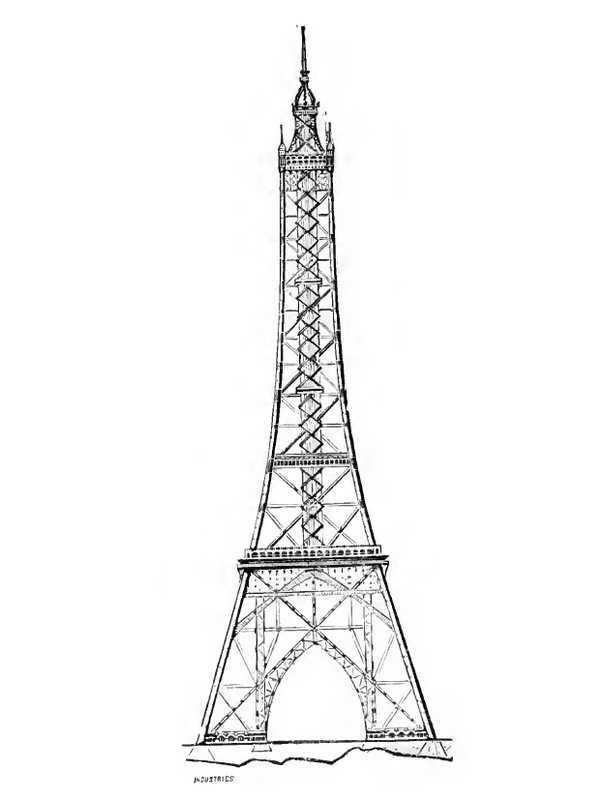 To do justice to the competitors, however, it should be added that the existence of the Eiffel Tower and the desire to avoid imitations have considerably increased the difficulties of the problem, because the Eiffel Tower meets the means the more rational and obvious to combine a monument with an architectural aspect, an economic construction. A number of projects were naturally eccentric and extravagant, while others had no architectural merit. We had no problem eliminating most of the projects presented to us, but it took a lot of study to get the final award. By confining ourselves to the examination of the projects developed by competent men, we have found that in some cases we have been preoccupied above all with making an economic construction, while in other cases, on the contrary, we have focused on the architectural effect. In comparing the projects, we have tried to put ourselves in the same position as the author or authors of each project, and we have attached special importance to the time and care drawing, resistance calculations and construction price quotes. After careful consideration, we decided to distribute the awards: first prize (500 guineas): MM. Stewart, Maclaren and Dunn; second prize (250 guineas): MM. Webster and Haigh. 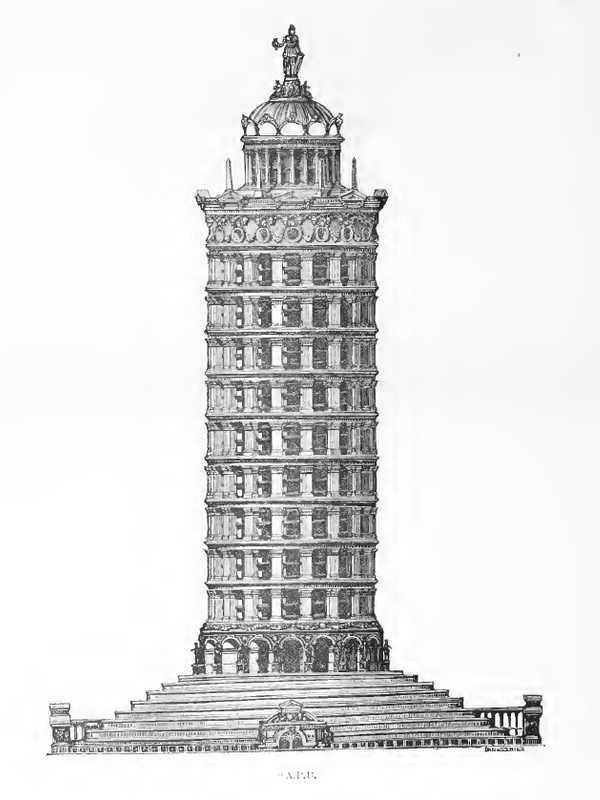 The first prize project was 1,200 feet high, an octagonal base 300 feet in diameter. 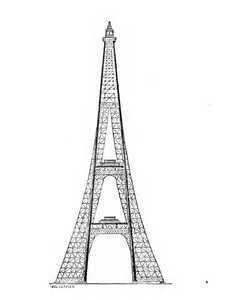 It had to be built of steel and its weight would have been around 14,659 tons. Its cost price was estimated at 9 million francs. The location chosen was Wembley Park, around London. When it came to executing it, Mr. Stewart's plans had to undergo a great deal of modification after agreement between Mr. Stewart and Mr. Benjamin Baker, consulting engineer of the Company. 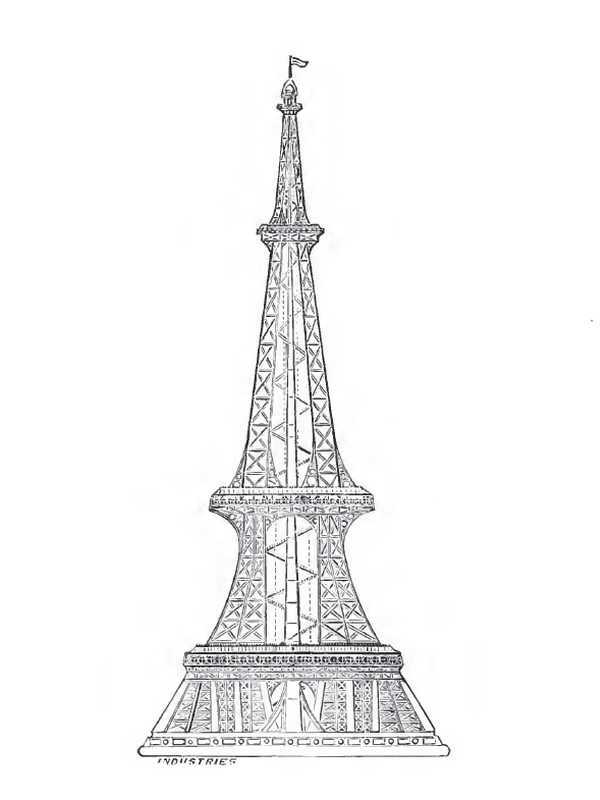 Octagon, the Tower became square and took with the Eiffel Tower an even greater resemblance; each of the four pillars was composed of four rectangular hip braces, and the construction system was almost identical to that of the Eiffel Tower, to the great satisfaction of Gustave Eiffel who saw here the confirmation of the technical choices he had made 15 years earlier. The XEngineer numbers of September 8, 1893 and May 11, 1894 give all the details of the construction and photographs of the beginning of the works. 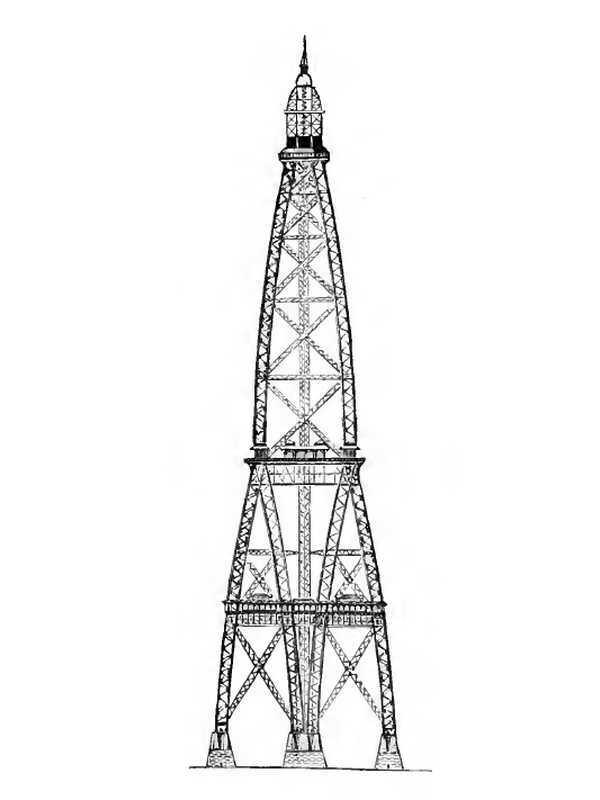 On June 15, 1893, the first metal pieces were laid and, in January 1894, the pillars reached the level of the first platform, 45 m high. 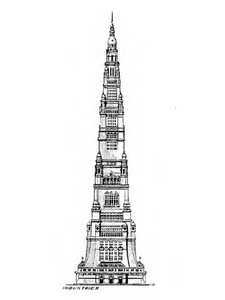 As for the elevators, it had been decided that the floor in the center of the Tower could be arranged without inconvenience, and all the elevators could be arranged vertically, which is a great simplification. 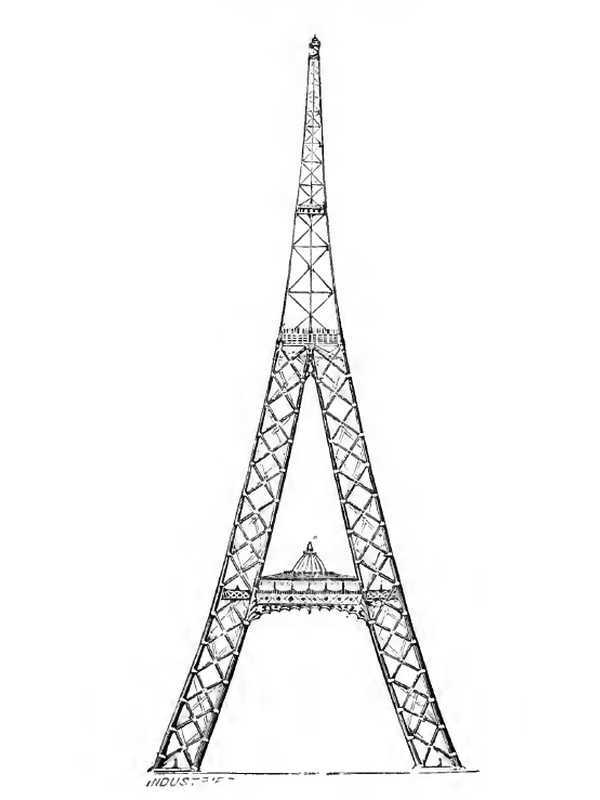 The inclined elevators of the Eiffel Tower corresponded, because of the situation of the latter in the Exhibition, of which it constituted a sort of triumphal entrance, to architectural necessities, which could be avoided, thanks to the situation of The tower of Wembley-Park, isolated on an eminence planted with tall trees. 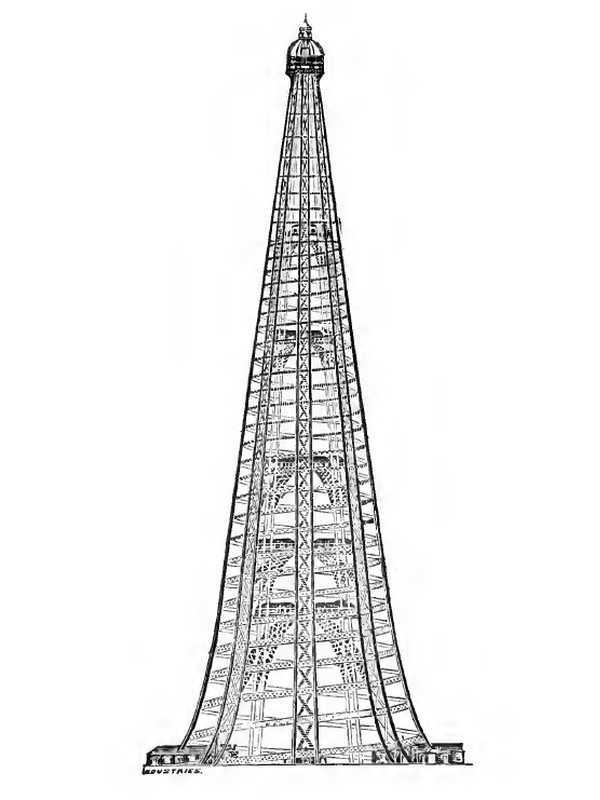 The two vertical lifts going to the first platform are carried by hydraulic pistons; the other two lifts had to climb directly from the first platform to the summit: they would have run 275 meters and would be driven by steam winches. Alas for the English and fortunately for Paris, for reasons that we do not know, either technical or financial, the work was interrupted and did not go beyond the first platform. Nowadays there is nothing left of this work of art. Designers: T. Otis, Rochester, USA. 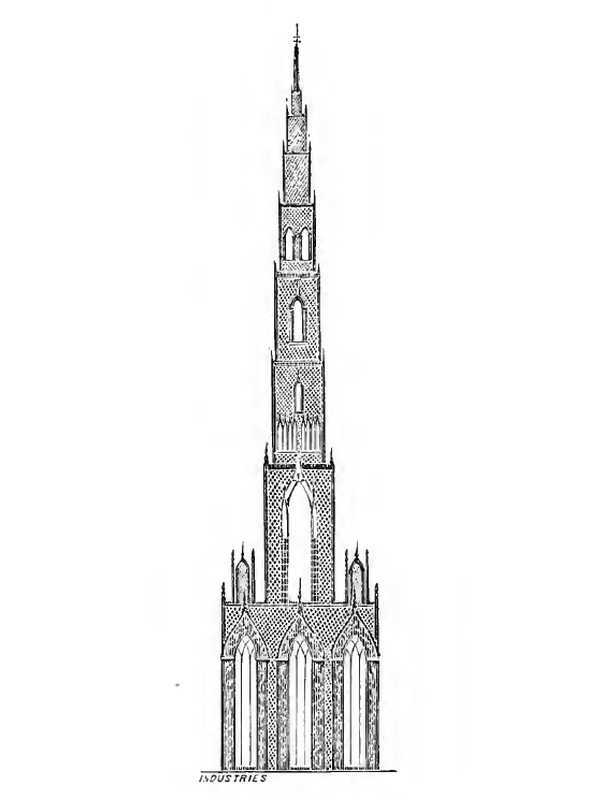 This tower was planned with a height of 1355 feet. 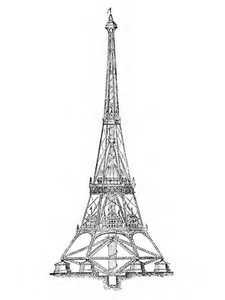 From a square base of 400 square feet, it was estimated at 21300 tons for a steel assembly, 26500 tons if it was built of iron. The cost has not been given. His description is quite pleasant. 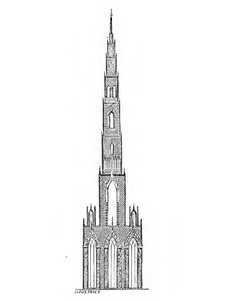 It is known from this project that this tower was to host a banquet hall of 400 square feet, 50 feet high. At the top of the 1st section there was a balcony, 50 feet from the ground. Three elevators and open-air stairways would have permitted the ascent to the 57-square-foot summit observatory. Designers: D. Vernon, Topsham, Devon. 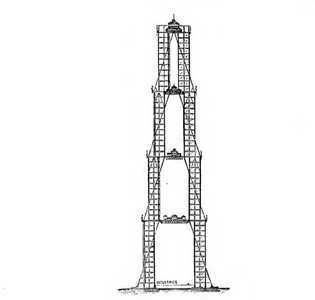 This tower is the least documented of all, it is not known that its size of 1225 feet. Designers: J. Batey, 47 Heytesbury Street, Dublin. 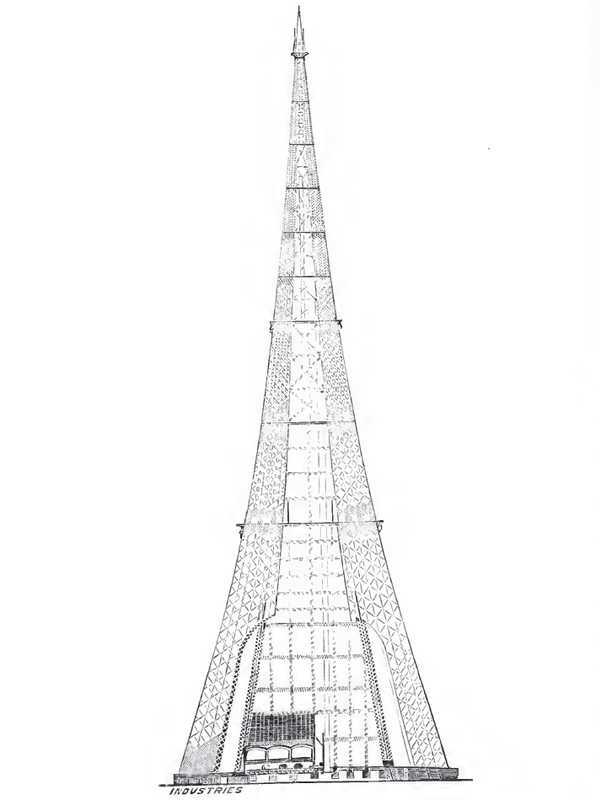 The tower proposed by this engineer was 1216 feet high for 9574 tons. She would have had a square base of 520 feet on one side and had to be made of steel. Its ridiculously low price of 40,957 pounds seems largely underestimated. 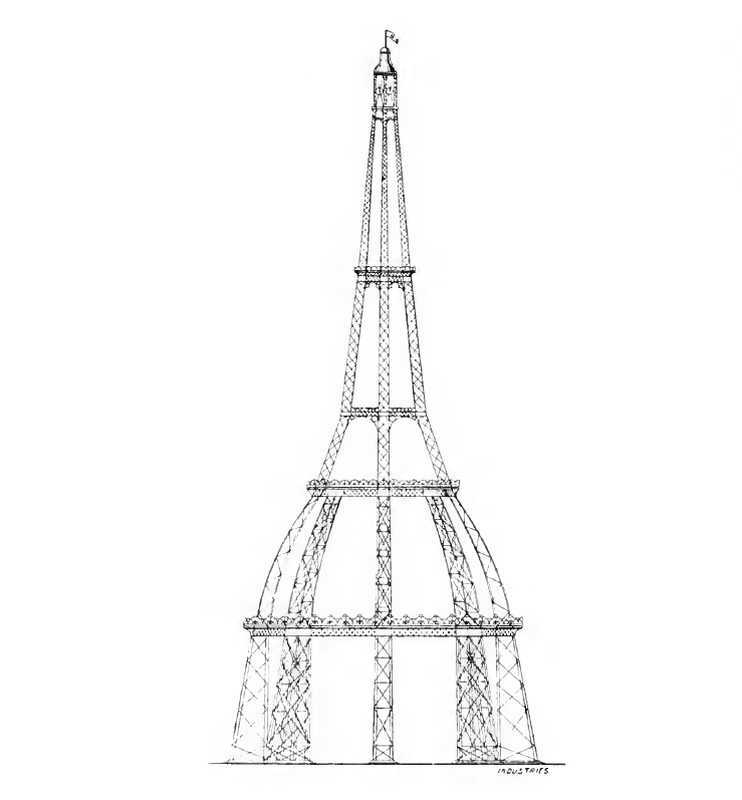 This tower consists of 4 steel tubes 3 feet in diameter at the top and 15 on the ground. 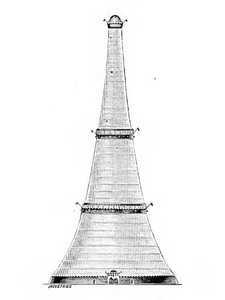 The structure is crowned for a lantern of 20 tons. The tower has two-by-two lifts, which saves energy, as the ascending elevators are helped by those going down, so very little energy is needed. Designers: H. Fidler, Lyndhurst Grove Park, Chiswick. This 1,200-foot tower has a 500-foot base for a weight of 11,500 tons. It is planned in steel for a price of 350,000 pounds. Wind pressure calculations are based on the value of 56 pounds per square foot for an area 3 times greater than the actual area. Two independent staircases go up to the first floor, while only one goes up from the first to the second. There are 4 lifts at 280 feet per minute 60 people, or 1440 visitors per hour, from the ground to the 4th floor. The summit is surmounted by a lantern. Designers: C. Baillairge, City Engineer, Quebec, Canada. High enough with its 1600 feet, this tower has a circular base. It weighs 14,303 tons and will be made of stone and iron. It will cost $ 925,516. 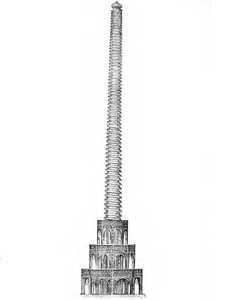 The interest of this tower is that it can be mounted in parts. Thus, it can at will be partially assembled or disassembled. All parts will be screwed instead of riveted. There will be elevators and stairs on all floors serving galleries 20 feet wide, except for the upper levels where they are 10 feet. 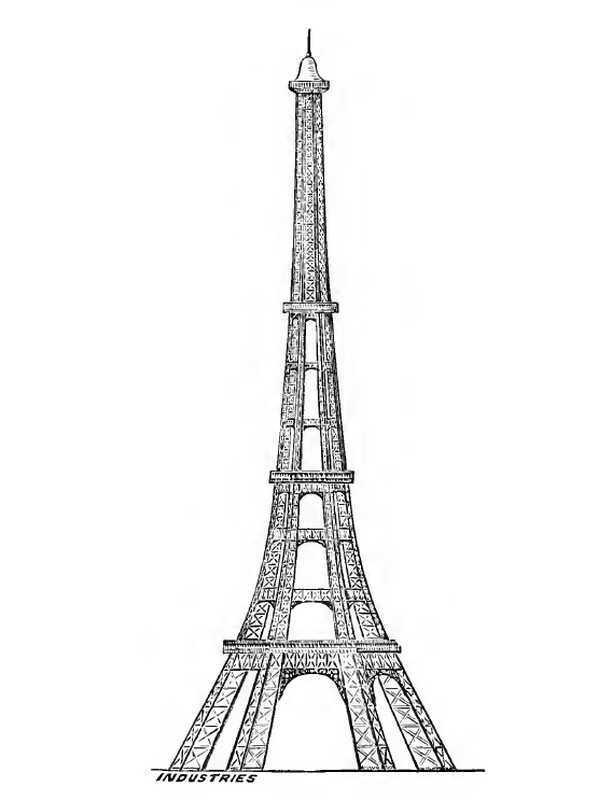 The closed structure should not be subjected to wind pressure of more than 56 pounds per square foot, making the tower 3 to 4 times stronger than it should be. The vertical pressure is also quite acceptable. It will be illuminated by electricity. Designers: S. Fisher, 32 Eagle Wharf Road, London. This very tall tower (2000 feet) is relatively improbable. It can, according to its designer, be reduced to 1700, 1500 or 1250 feet. With a circular base, it would weigh 312,550 tons, and it would be made of stone and iron. This tower aims to become a real monument. 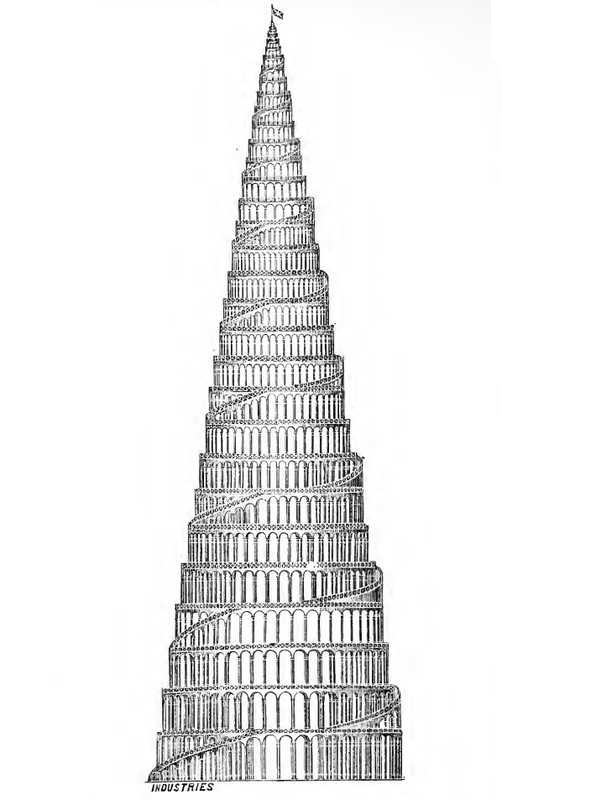 Decorated with a spiral, it is supposed to be representative of the Egyptian history of the British Empire during the reign of Queen Victoria. The designer plans to put a train following the spiral that would ride visitors to the summit following a slope ranging from 1 / 20th to 1 / 10th. There will also be 12 hydraulic lifts and a machine that can provide 500 horsepower. The tower B. Kinkel and Pohl. Designers: B. Kinkel and Pohl, Washington, USA. This 1250-foot tower is circular in shape, with a base of 192 feet. It will cost, according to the designers, $ 1,687,900 for a weight not given. 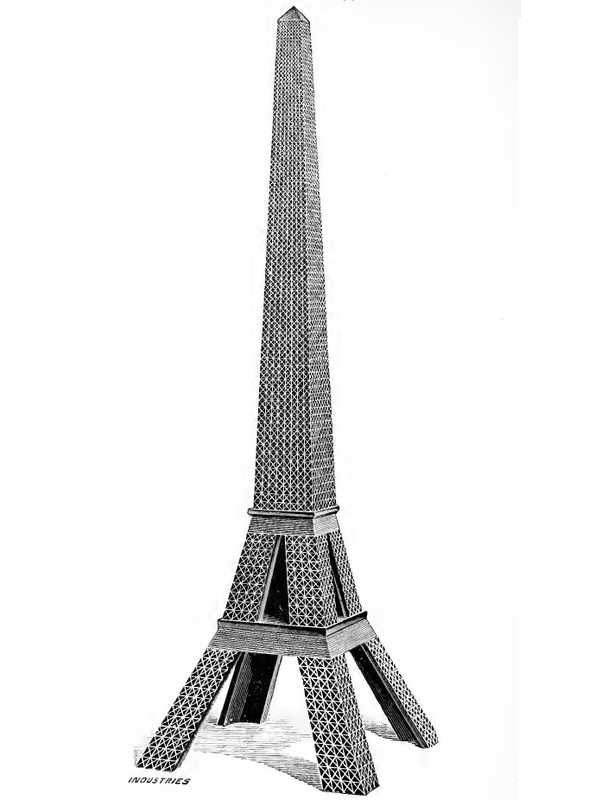 This tower consists of 16 curved steel legs, ranging from 30 feet on the ground to 5 feet at the top. The architectural work tends towards the oriental style, with large terraces, pavilions, minarets, etc. It would have a total area of 80,000 square feet, accessible with 4 lifts traveling 250 feet per minute. The wind pressure is 60 pounds per square foot. The globe at the top is 25 feet in diameter and contains 16 large power bulbs. The balconies are also equipped with electric bulbs. On the ground 12 rooms contain restaurants, shops, etc. on 4000 square feet of surface. Such arrangements are also found in the floors. The tower F. Persson and B. Wallin. Designers: F. Persson and B. Wallin, Goteborg, Sweden. We are here on a tour quite well described. Expected to measure 1200 feet it has a hexagonal base and was to weigh 7000 tons. It was planned in steel, but its cost was not considered. 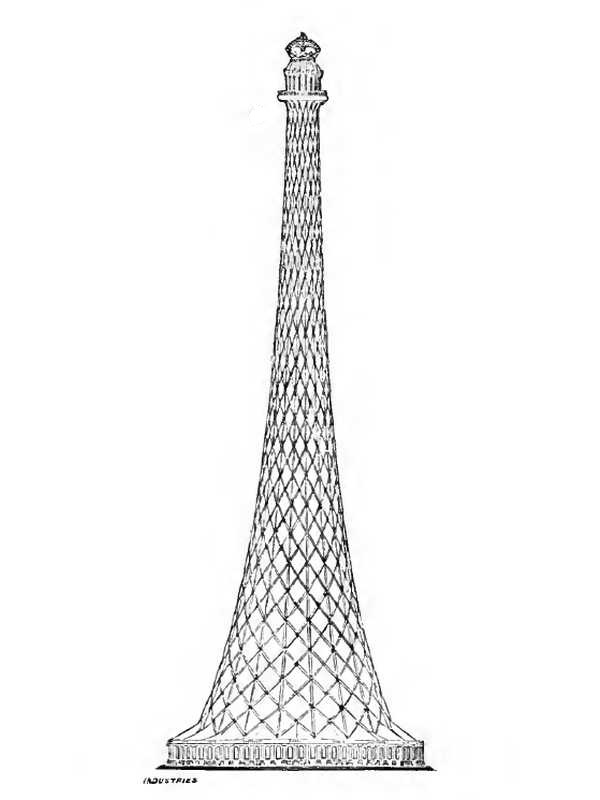 The main shape of this tower is a hexagonal or sylindrical tube built in steel plate, large enough to make room for an elevator. It would be 36 feet in diameter at its base and 15 at the top. It contains 130,000 square feet of total area, of which 60,000 for the first and 23,000 for the second. Designers: R. Nettle, Redruth. This 1,500-foot tower is undocumented, we only know its cost, 204,941 pounds. Designers: F. Wilkings, 13 Poland Street, London. 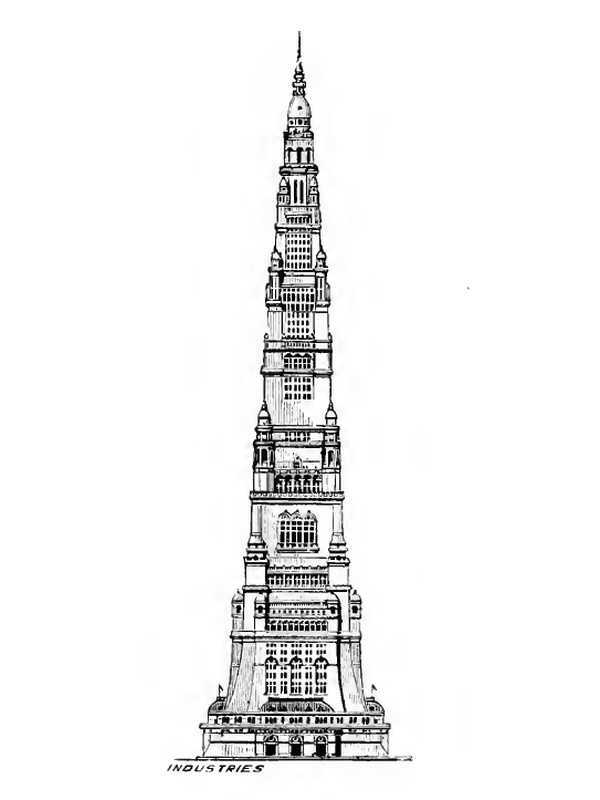 This 1234-foot tall tower has a base 40 feet in diameter. 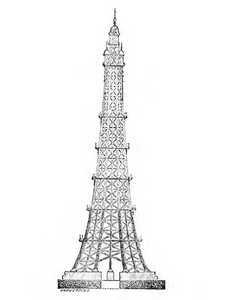 It was planned in steel and glass, at a cost of 107,000 pounds. This tower was supposed to receive homes and offices. There would have been 12 separate elevators. The main energy would have been electricity. 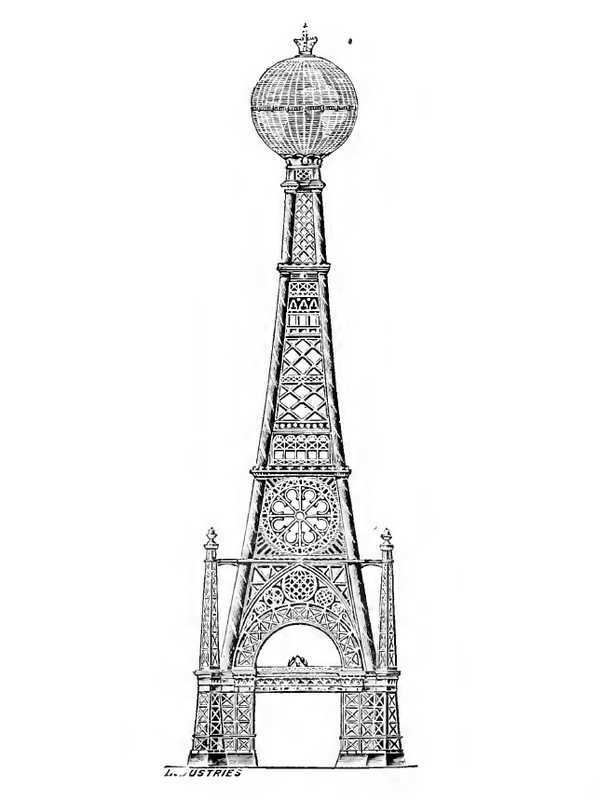 The designer proposed to build this tower at Kensington Gardens, or at Exhibition Road, so that it could be used as private apartments, as he had planned. But more than a residential tower, it had to contain everything that makes life in society possible: school, various institutions, restaurants, cultural centers, laboratories, courthouses, etc. 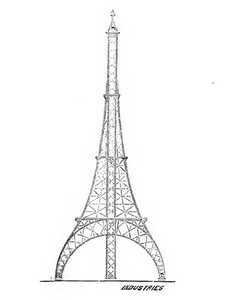 The designer claimed that his tower could be mounted in only 12 months. Designers: E. Shaw, Boston, Massachusetts, USA. 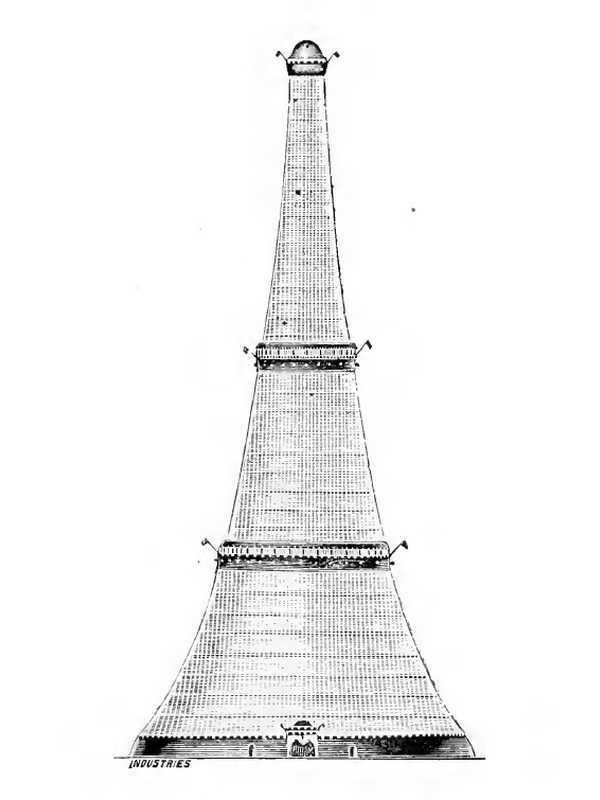 This tower is planned for a height of 1400 feet, plus 100 feet for the lantern, at the top. The base of this tower is square, each side being 500 feet long. It is provided in steel and iron, at a cost of 575 933 pounds. This tower has 4 pillars made of tubular columns. At ground level there will be 4 pavilions for an area of ​​74,000 square feet. On the first floor, the main one, is 360 feet, this is the level of the walk. The floor is 300 square feet. The upper level is 28,000 square feet, 575 feet high. The highest level is at 1200 feet in height, this is the level of the observatory. Above these levels there remains the meteorological laboratory, surmounted by the lantern 10 feet in diameter. The light comes from electricity. 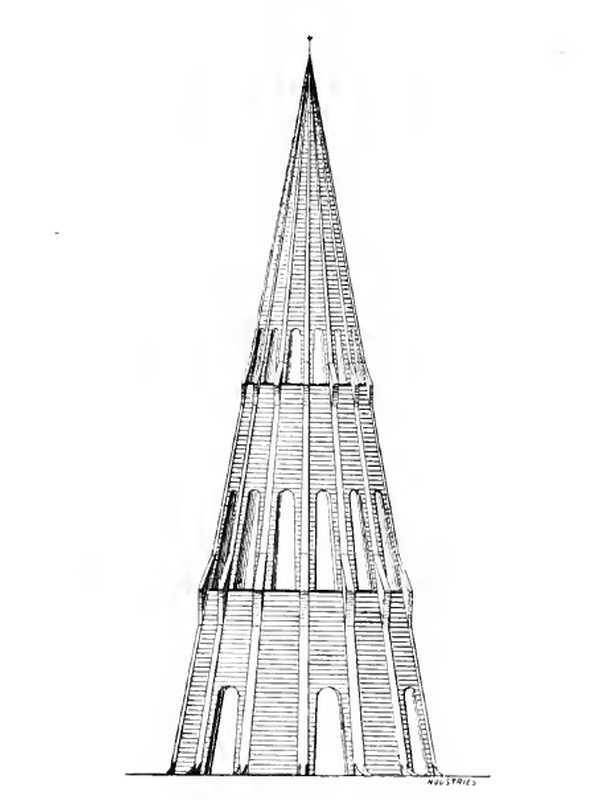 The top of the tower is pierced with 4 wells leaving the passage to 4 elevators. There are also 3 stairs 3 feet wide, one for the climb, the others for the descent. Both elevators have a climb of 400 feet per minute. The wind pressure at the top of the tower is estimated at 56 pounds per square foot. Designers: E. Worral, 26, Byrom Street, Liverpool. 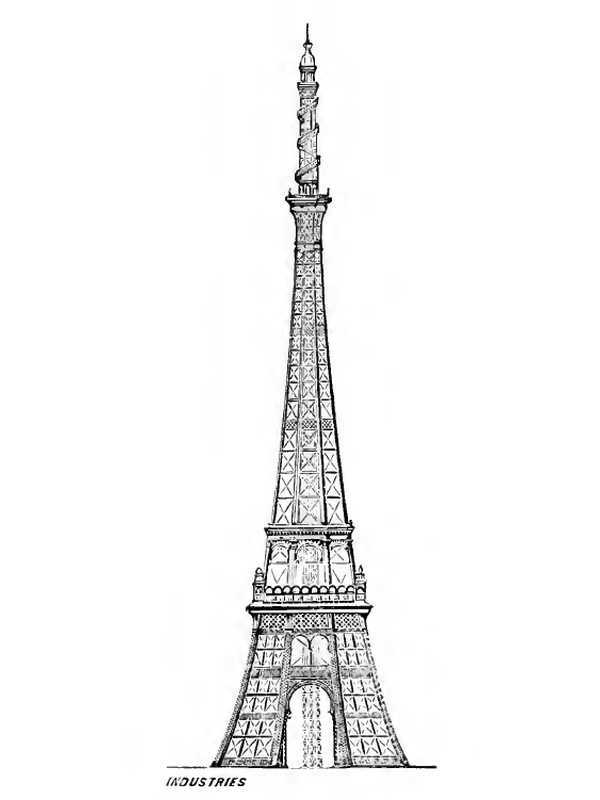 This classic tower in its size (1200 feet) for this contest is much more original on its form. It has a square base, but neither its weight nor its cost is given. The upper floor of this tower is 195 square feet containing an observatory and restaurants. The roof is made of steel and glass. The base is a 125 square foot rectangle at its narrowest foot. 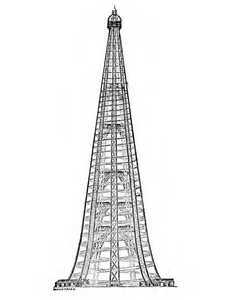 There are 4 elevators for 875 feet in height, plus 4 stairs 20 feet wide. The base is 40 feet high, forming a 40,000 square foot space. The first and second stages are similar in shape, 400 feet in diameter and composed of modules separated by metal plates. These floors will contain restaurants, galleries, walks, and above a music room. The 2nd floor is 1000 feet from the ground. Two of the lifts stop at all floors, and two others go directly to the top. The tower Thos V. Trew. Designers: Thos V. Trew, 26 Tarbert Road, East Dulwich Grove, London. At a height of 1267 feet, this tower is circular and is 400 feet in diameter, plus 40 bases. 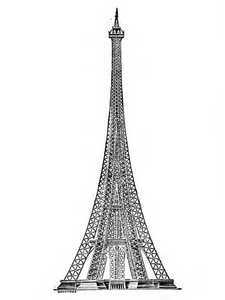 Its weight is 11,770 tons, it is planned in iron and steel. The cost of steel is 260,000 pounds. The general shape recalls the "Crown", the emblems of the United Kingdom (Thistle, Rose, Leek) with the colonies at their bases. There are 18 vertical beams assembled together, and at the top is this crown. The interior is illuminated with 18 electric lamps. The platforms contain restaurants, outdoor galleries, walks, and wide terraces. There are 7 lifts, 4 to go up to the 1st level deck and 3 to get to the top. Each lift can carry 30 people. The building at the base of the building is brick, it would contain stores. Designers: J. Thornycroft, Chiswick, London. 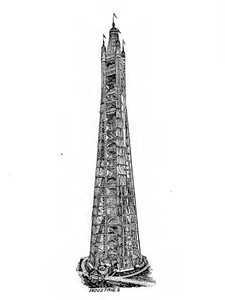 This tower would measure 1760 feet if it is built. 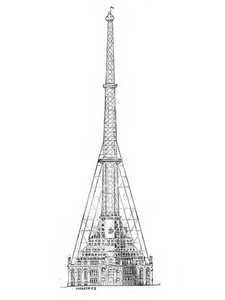 On a triangular plane, it must weigh 16,830 tons of steel. The general shape of this tower is 3 big pillars coming together. The lifts are air-pressure and reside in the pillars, they go from the ground to the top. It is possible to have up to 20,000 people on this tower at the same time. The elevators have been specially designed for this tower. Some climb directly to the summit, others stop at all floors. Designers: W. Woodcock, 6 Victoria Street, London. 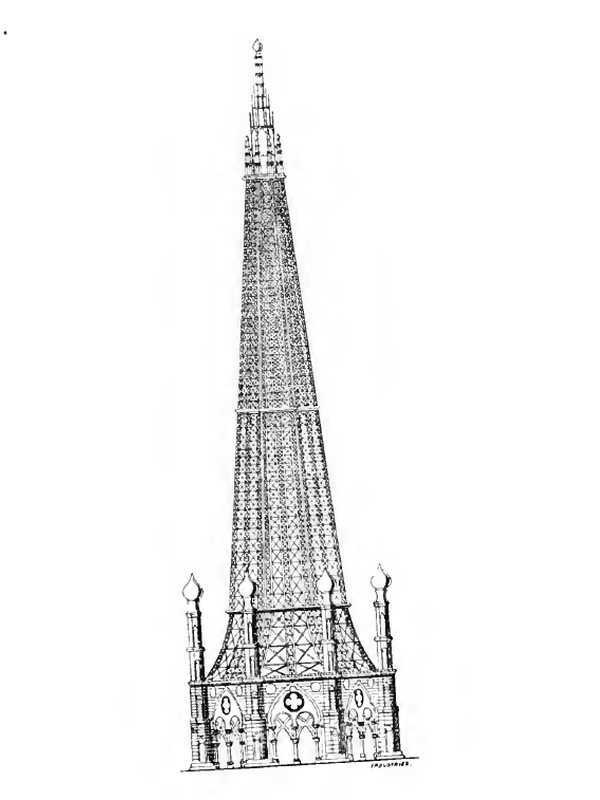 This tower was planned for a height of 1300 feet. Its octagonal base 310 feet in diameter had to support the weight of 12,000 tons of steel. Its price was estimated at 349,250 pounds, without the decorations. This tower is divided into 4 parts, each except the top, being divided into 2 levels. The space between the two levels is used in restaurants, shops, post offices, etc. The highest floor is reserved for walks There are different levels for the arrival of lifts. The two levels of each floor are connected by stairs. The 1st floor deck is 63,000 square feet, the 2nd floor is 26,400, the 3rd floor is 8600 and the top is 2000 square feet. Electricity is used for both elevators and lighting. These elevators would have had a yield of up to 200 feet per minute. To increase safety the machinery is installed remotely. Two stairs go from the ground to the summit, one for the climb, the other for the descent. The lantern, at the top, is a marine spotlight. The tower of Vere Buckingham. Designers: De Vere Buckingham, St. John Street, Winchester. 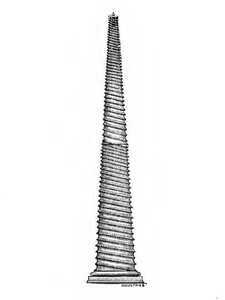 This is a 1700-foot steel tower. It should have cost, if it had been actually built, 235,603 pounds. Designers: J. Horton, Copley, near Halifax, Yorks. This tower of just 1200 feet has a circular base. Its elevation is decreasing, at the top we are only 42 feet in diameter. The weight is 16,760 tons, it is corrugated steel. The general shape is obtained thanks to the corrugated steel, it has 60 undulations which turn in spiral from the ground to the top. The floor plates are 1 inch thick and 4 to 6 feet wide to reach the top at 9 inches radius. All around there is a spiral that rises slowly, at a rate of 1 to 10. A telescopic lift 150 feet long, usable in calm weather, works with hydraulic power. This tower includes 24 floors of 50 feet and 72 hydraulic lifts, 3 per floor. Designers: J. Harrison-Vasey, 24 Vicarage Terrace, Sunderland. The height of this tower is 1820 feet, it has a circular shape. The area at the foot of the building is 20 acres. The building itself is 10,000 tons, it is provided in steel for a cost of 1,000,000 pounds. The floor is very large, and serves as a starting point for the railroad that climbs to the top of the spiral tower. The journey is 2 miles, with a slope of 1 to 20. At ground level there is the elevator station, the waiting room, the engine rooms, and so on. The floors are all built of steel. There is even a captive parachute for 4 people who goes down into one of the corners, parachute braked by a mechanical system. The observatory is at the top level, at 1780 feet in height. This tower can be dismantled easily. 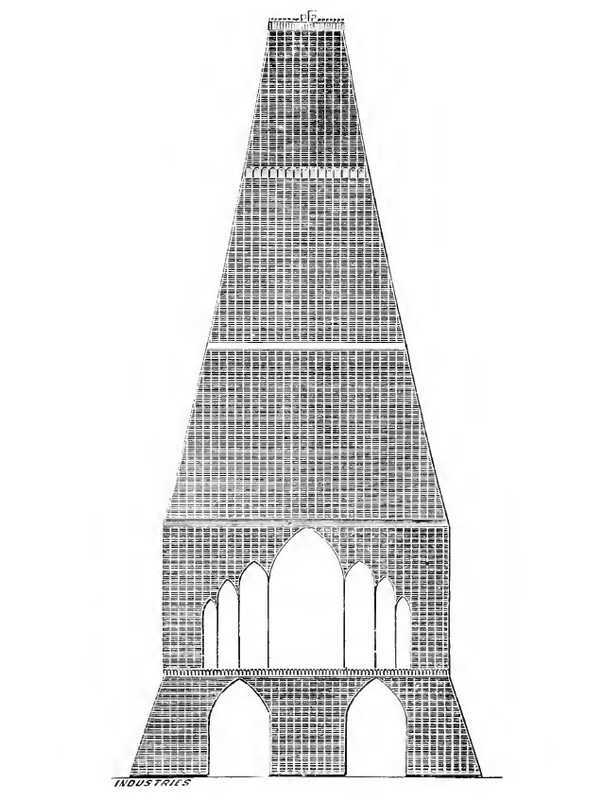 The tower J. W. Couchman. Designers: J. W. Couchman, Pembury Road, Tottenham, London. This tower 1900 feet high weighs 44,118 tons, which is very heavy. It is planned in steel for a cost of 2,250,987 pounds. His plan is circular. The tower T. Clarke, Joseph Mayer and W. Hildenbrand. Designers: T. Clarke, Broadway, New York and Joseph Mayer, Union Bridge, Connecticut, and W. Hildenbrand. 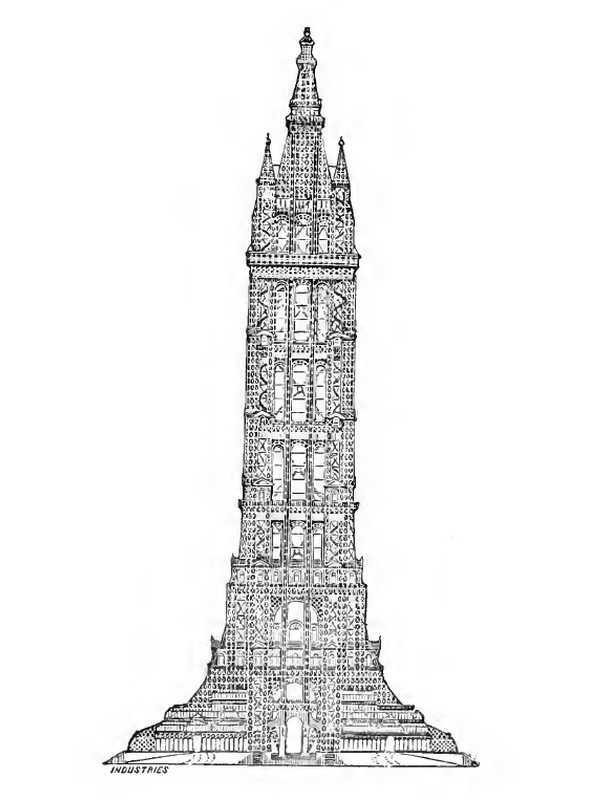 This 1280-foot tall tower has a 350 square foot octagonal base. It should have weighed 7070 tons, if it had been actually built. It would have been made of steel for a cost of 1,115,000 pounds. 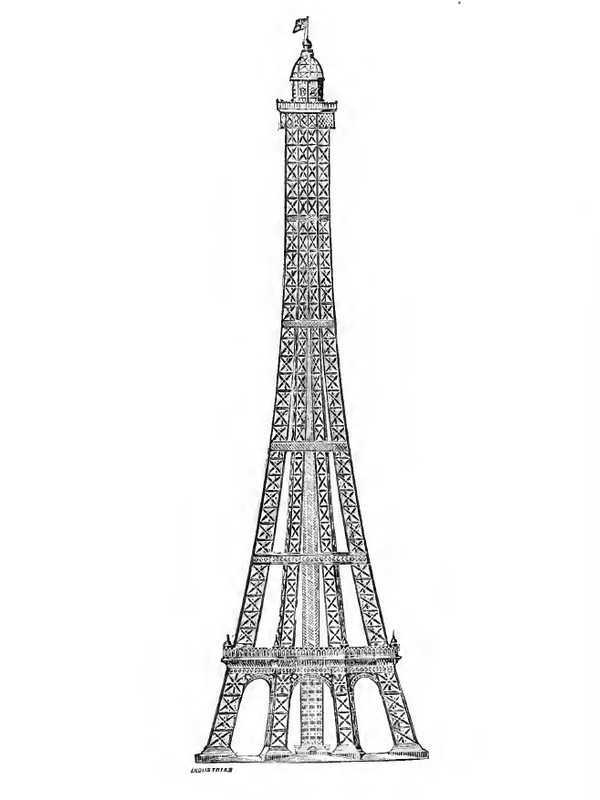 With elegant architecture, elevators and stairs this tower has a double capacity of the Eiffel Tower. It is made of pre-assembled steel plates allowing elevation in only 18 months. Designers: James Arnold, Lincolns Eastleigh, Southampton. It is a 1320-foot hexagonal tower containing a cylindrical central column. Its weight is 142,207 tons, which is extremely heavy. It is made of steel and iron. Its cost has not been estimated. What is highlighted in this tower is the beautiful brightness of the interior. There will be 6 platforms containing restaurants, dining rooms, offices, a chapel, a hotel, and a sanatorium. 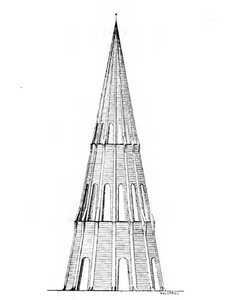 The upper part of the tower will be covered with a dome of glass. Electricity will be provided for lighting. The elevators will work at a speed of 600 feet per minute, also with electricity. The tower Henry Rose and E. Edwards. Designers: Henry Rose, 2 Mansions Princes, Victoria Street, London and E. Edwards, 12 Dartmouth Street, Westminster. This tower is one of the best described, measuring 1274 feet high on an octagonal base. From 470 feet to its base, it would rise as it dwindled to only 40 feet at the summit. Its estimated weight is 16,000 tons and is planned in steel but with a focus on glass and terracotta. Its cost is 537,000 pounds. 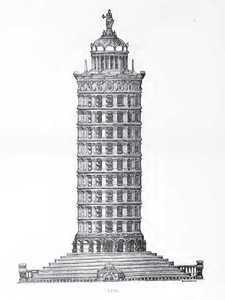 The ways to go up in this tower are: A railway with a slope of 1 / 6th, in double spiral, elevators "Otis" and two stairs of 12 feet wide. The 8 main pillars are cruciform, they are 100 feet by 40 at their bases and finish at 10 by 10 at the top There is 8 floor, including the final floor of the lantern. The train will climb at a speed of 5 miles per hour, which will allow to climb 1600 passengers per hour. This train will run on electricity, which will also be the energy of lighting. This tower will contain restaurants, offices, shops. On the 3rd floor there will be a photography hall. On the 4th floor there will be 4 club houses that could be those of London. The fifth would contain two banquet or reception rooms or private events, and on the sixth floor a laboratory, another photography room, a small café, and so on. Designers: J. Kelly, Pyrmont House, Winchmore Hill, London. 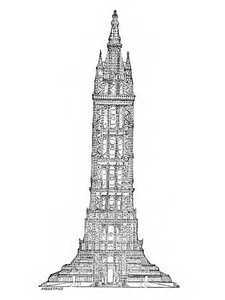 This very tall tower is planned for 2000 feet, it would have had a square base of 1672 feet aside for a central area of 64 acres. Its weight is estimated at 25,000 tons, which makes it a very heavy tower, and again, it's without the machinery or the elevators. The expected metal is steel. Its cost is 120,000 pounds, but only for its elevation. The floors are accessible through lifts of the simplest type existing, operating right next to the columns in the corners. This tower is lit by the electricity generated by the same system as for the elevators. It is designed to be able to receive different events at the same time. Designers: A. Cummings, 26 Maygrove Road, Kilburn, London. 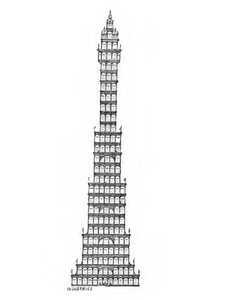 This tower of a normal height for this competition (1235 feet) is planned in steel, for an undisclosed weight. It is supposed to cost £ 530,000, including foundations. This tower consists of 12 main columns 2 inches thick on the ground, and 1 at the top. The first floor soil columns will be filled with ballast cement to increase the stability and rigidity of the assembly. It is planned 8 floors and US elevators, as well as electric lighting. Designers: C. Lean, 72 Palace Chambers, Westminster. 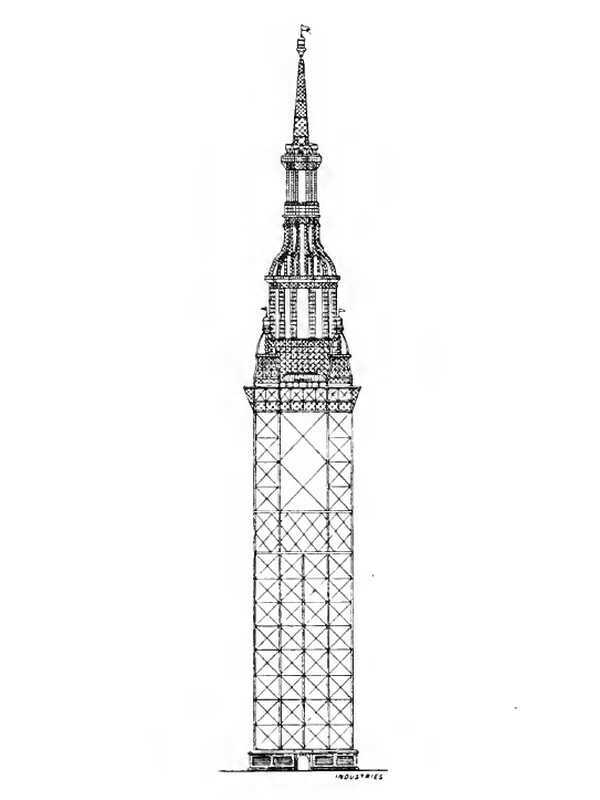 At an exact height of 1200 feet, this tower has a hexagonal base and is provided in steel. However, its cost and weight are not given by the designer. 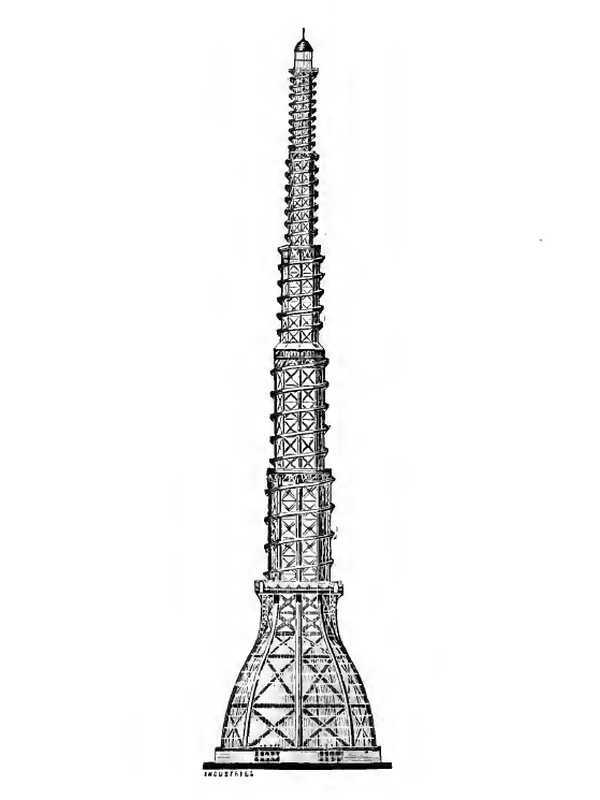 The general shape of this tower was decided for the correct installation of the elevators. These lifts are central to everything, they are small and very numerous, so that if one breaks down, it has no impact on visitors. It is divided into 6 parts but for now it has been decided to put platforms only on the 1st, 3rd and 6th floor. Each floor is pierced by holes allowing the passage of lifts, but also stairs, amenities, etc. At the top there will be a scientific laboratory. It is the electricity that must be the main energy of the tower, both for elevators and for lighting. The tower T. Thomas and W. Lewis. Designers: T. Thomas and W. Lewis, 20 Pembroke Terrace, Cardin. 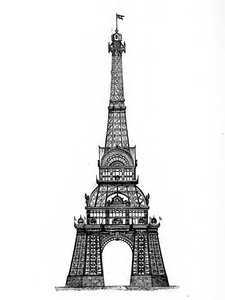 It is a 1240 square foot tower weighing 18 891 tons. It is provided in metal. Its estimated cost is 363,075 pounds. The foundations of this tower are made of 16 steel boxes grouped four by four. The pressure on the ground should not be more than 3 tons per square foot. From these boxes start steel tubes rising in the air and gathering at the level of the 2nd floor. These tubes, 12 feet at the base, slowly decreases before joining in a single tube of 49 feet. From there the structure continues in 8 tubes starting in square. At 300 feet high there is the platform, it will be equipped with a concert hall, a hotel, shops, etc. At 722 feet there is the second platform containing a building of 12,100 square feet, it will be intended for the walk. The 3rd platform will be at the height of 945 feet. There will be 8 elevators starting from the ground and going up to the first platform, and 3 more, tires, climbing to the top. The light will be electric. Designers: P. Campanakis, Pera House Sech-Han, No. 28, Constantinople. This tower is one of the only ones whose height is expressed in meter, it was planned for 365m. From a triangular base, it had to be made of steel. Its weight has not been calculated, as well as its cost. This tower is characterized by its low cost, according to the designer. It is of great resistance and has good stability as well, both in keeping with an original appearance. It is equipped with 11 lifts. Designers: A. Briand, 11 rue Corbeau, Anzin, France. 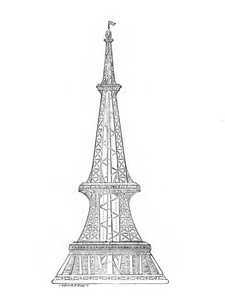 Tower of French design, it is 1200 feet high and has a triangular base. It would have been made of steel and would have cost 1,215,000 pounds. Nicknamed "Time is money", this tower would have been equipped with a large clock face. Designers: Albert Brunel, 3 Quai de Paris, Rouen. This tower was supposed to be very high, 2296 feet. Circular in shape, 574 feet in diameter, it weighed 196,702 tons and was made of granite. its cost is estimated at 1,104,325 pounds. Designers: O. Ross, Relf Road, East Dulwich. 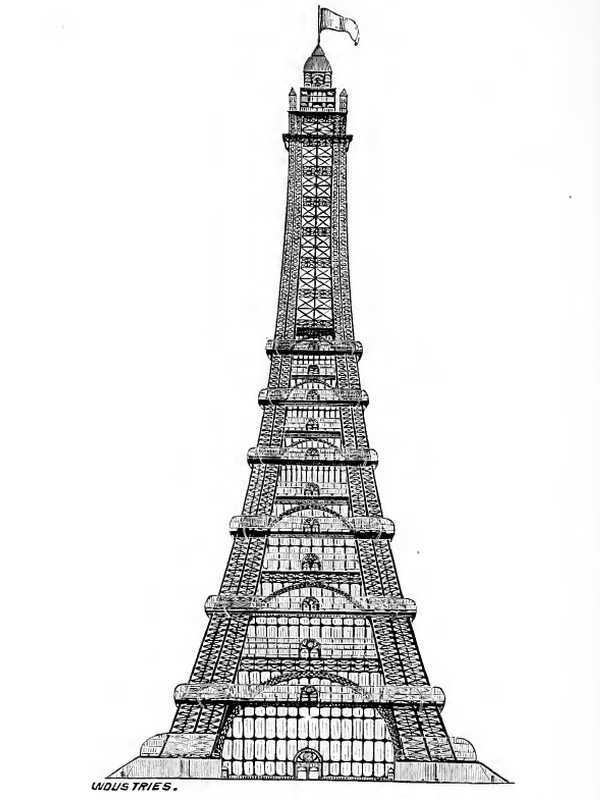 With a planned height of 1260 feet, this tower was to have a weight of 6150 tons of steel, 820 of iron and 800 of cast iron. It was to cost 209,250 pounds. 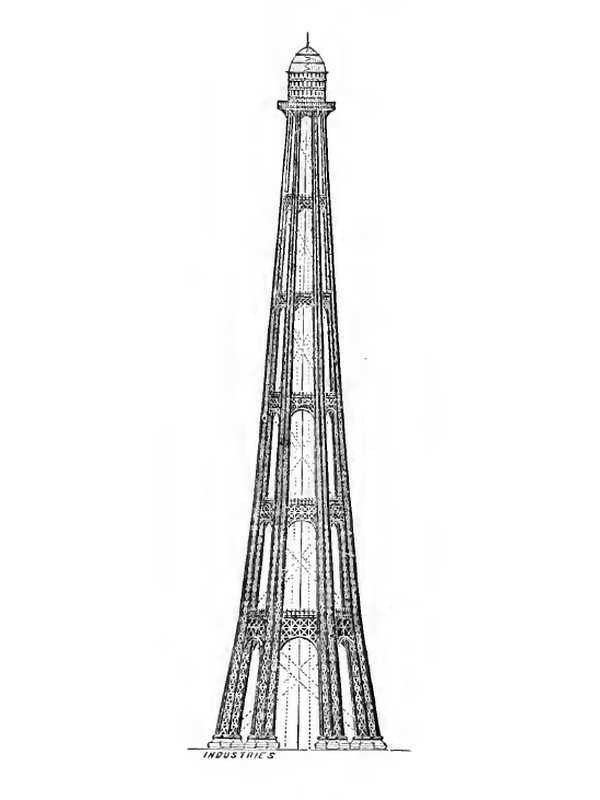 The skeleton of this tower consists of cast iron tube to get as far away as possible from the Eiffel Tower. The ornaments resemble a rose, a thistle and a leek, to recall the symbols of the United Kingdom. There would have been several vertical tubes 10 feet high, placed one above the other. In rising the number of tubes would have diminished. It was planned electric lighting and 10 hydraulic lifts. The tower J. C. Chapman. Designers: J. C. Chapman, 52 Elthorne Road, Holloway, London. 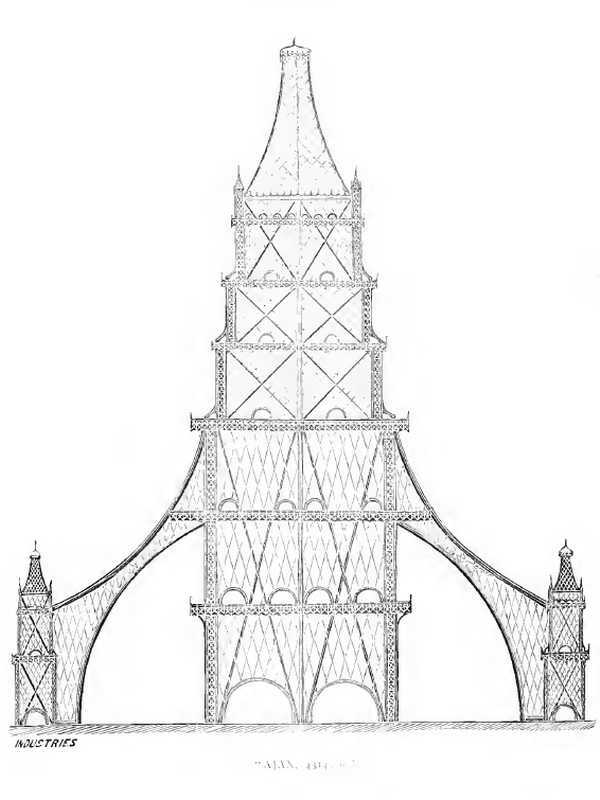 The only thing we know about this tower is that it had to measure 1200 feet, but the designer did not give any other information. Designers: J. Bateman, Beulah Road 11 West, Thornton Heath, London. We are on a 1260 foot hexagonal tower. Its weight is 9,243 tons, just for metal. It is steel. The estimated price is 285 278 pounds. 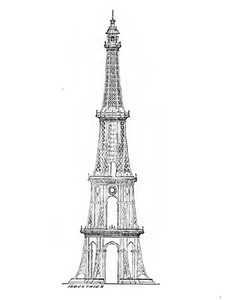 This tower was to be divided into 4 floors at heights of 200, 500, 800 and 1200 feet, respectively. Stage N ° 3 is planned to have a diameter of 50 feet, the 4th 45 feet it was to be equipped with a dome of glass. A gallery would have allowed visitors to walk around, it was 8 feet 6 inches wide. There would have been elevators and stairs but the energy of elevators has not been decided yet, although steam is preferred. It would have been possible to add floors without significant impact on the structure. 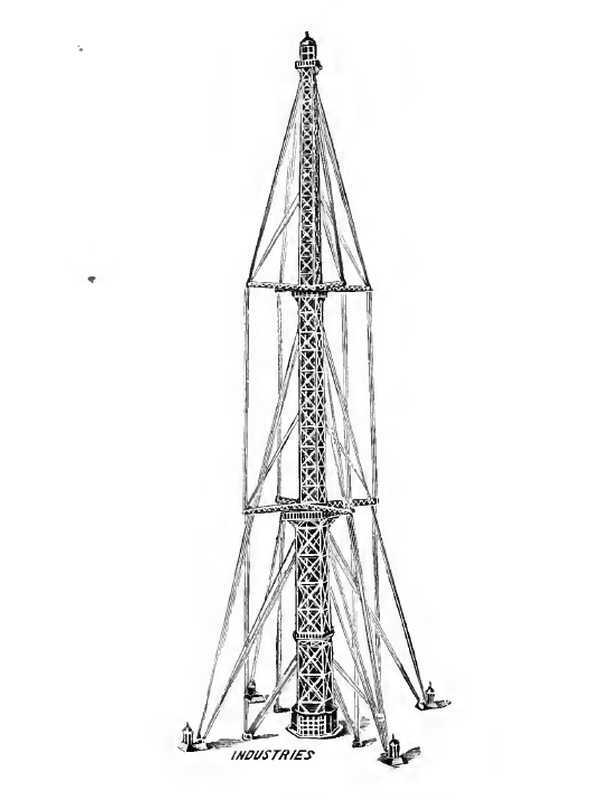 The electricity was to be used to light this tower. Designers: E. Duncan, 3 Cross Road, Belsize Park, London. This tower is a little over 1200 feet tall. On a 500-foot square base, it is expected to weigh 12,195 tons of steel at a cost of 400,000 pounds. This tower is very little documented. It is composed of 4 platforms accessible through electric lifts. 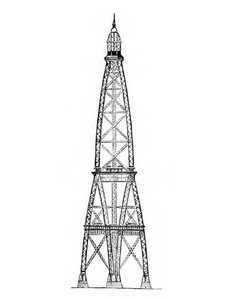 It is a component of this tower, electricity, it puts forward this new source of energy. Designers: W. Gibson, 15 Queen Street, London. This tower measures exactly 1232 feet high, it has a square base. It is intended to be built of steel. It would weigh 7,000 tons for the metal part and 25,000 for the foundations. Its cost is 499,500 pounds. 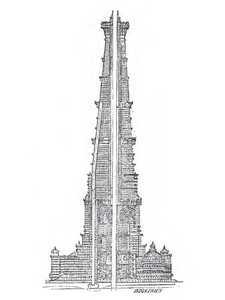 This tower is inspired by the finesse of Sir Christopher Wren's work at Bow Church, Cheapside. The small amount of metal needed to reduce costs while obtaining large spaces to develop, which will generate significant income. 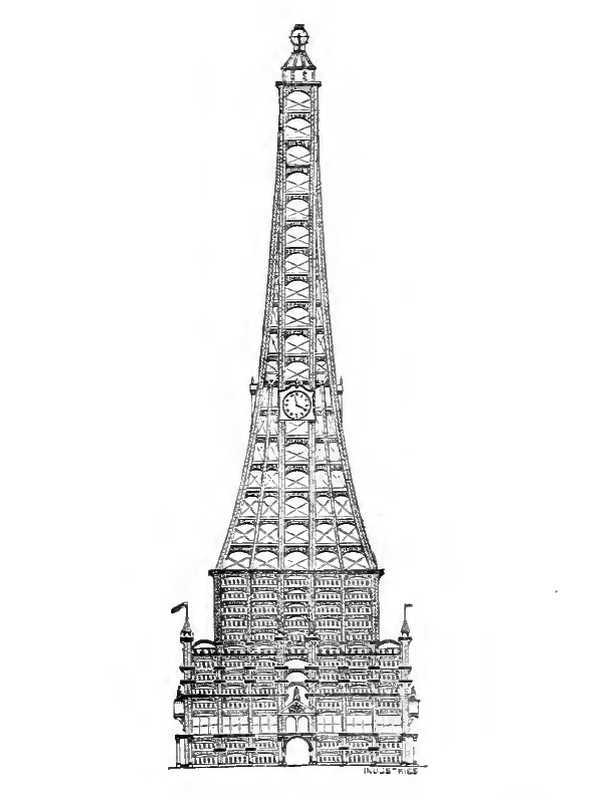 This tower would contain a theater, an illuminated garden, restaurants. At the top there is an electric lantern. The 6th floor contains rooms, a laboratory, a dining room, etc. There is a big lift in each pillar plus stairs. The tower Nicholas C. Vouro. Designers: Peternevouro, c / o Nicholas C. Vouro, Constantinople. The tower that this architect has planned is only 1070 feet tall and therefore does not meet the minimum size criteria required by the specifications. The tower Sir Bradford Leslie. Designers: Sir Bradford Leslie, Tarrangower, Willesden Lane, London, N.W. This tower measures 1200m with a square plan. Its weight is impressive, it is 30 000 tons, without the foundations. It is provided in cast iron and iron for a cost of 1,372,266 pounds, including foundations. This tower has an original but very simple form. It consists of 4 levels, each having 4 pillars and a platform. Each pillar is cast iron, they are 50 square feet in area. They are distant of 187 feet. The spaces between each level are constant: 300 feet, all round. There are 4 floors of 152,340 square feet. In each pillar there is a staircase accessing the summit. There are also two pairs of lifts and two hoists. 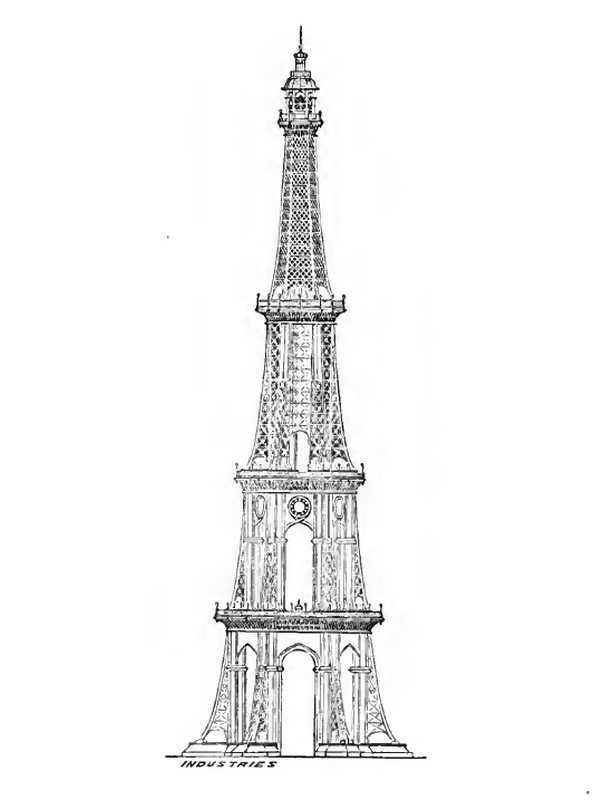 The tower of Stewart, McLaren et Dunn, lauréate du concours de tour à Londres. Designers: Stewart, 2 Queen Square Place, McLaren and Dunn, 21 King William Street, Strand. 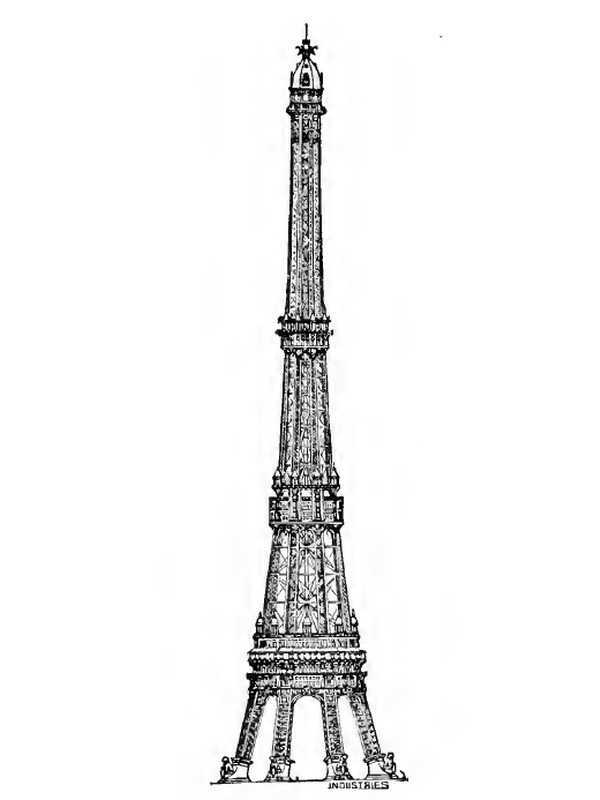 With a planned height of 1200 feet and a weight of 14659 tons, this tower is made of steel. Its cost is supposed to be 352 222 pounds. Octagonal, this tower is a balance between economy and efficiency. The octagon offers resistance to bending almost in all directions. This plan equally admits to have a good view of all sides, and gives a sufficient variety of light and shadow on its faces. The adopted style is of oriental character. 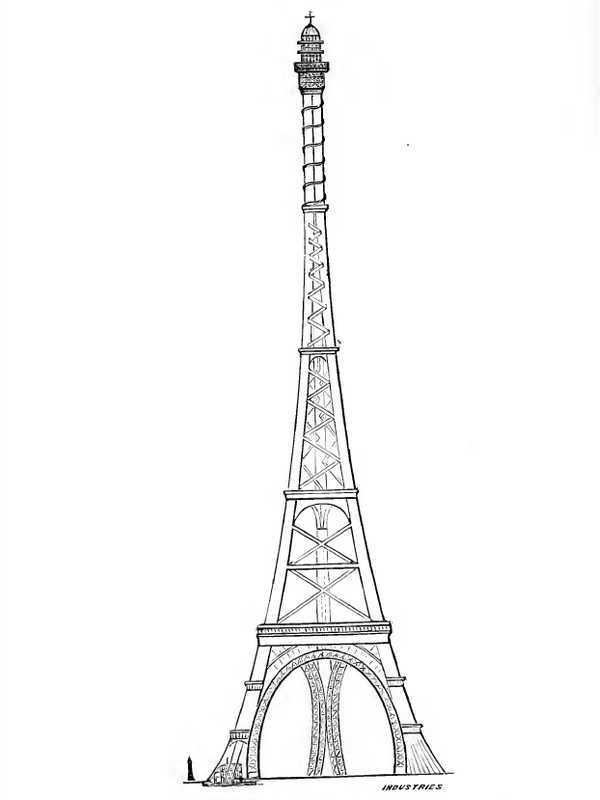 Four lifts are provided up to the first platform, plus 2 stairs located in the legs of the Tower. The main platform is 200 feet above the ground, it contains a large central hall, octagonal in shape of 20,000 square feet in area, and 60 feet high. Around the platform there is a balcony. A hotel with 90 rooms is planned. 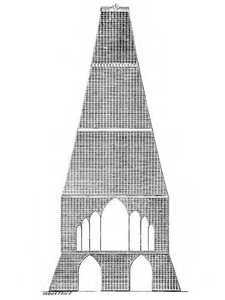 The masonry consists of 3 layers of plaster on iron wire mesh forming 2 distinct air spaces. The floors will be concrete and steel. A 10,000 square foot covered hall is located on the second platform; 3 lifts are provided from the first upwards. There will be other establishments, such as restaurants, etc. This tower will be lit by electricity. Designers: A. Hills, Thames Iron Works an Shipbuilding Co., Orchard Yard, Blackwall. This tower is probably the highest of all, it measures 2,0007 feet from the ground to the summit, which is more than 650m high. It was to be built on a base of 644 square feet for an impressive weight of 32,000 tons. Steel was the intended material. The expected cost is £ 1,525,000, including foundations. This building is inspired by the obelisks of ancient Egypt. The tower is a set of small symmetrical elements correctly arranged, which ensures an efficient construction method and a controlled cost. The first floor is occupied by a garden that could serve as a place of exhibition. The second floor would have been a theater, 600 feet from the ground. The 3rd would contain a museum, a library and an art gallery. The 4th floor would have been a temple, then there would have been international shops, before the hotel floors. At the top of the tower there would have been a weather station. The shape of the summit recalls that of the Egyptian obelisks. Elevators were supposed to run on electricity, as was the heating of the rooms. Designers: John Heath, 16 Furnivars Inn, London E.C. 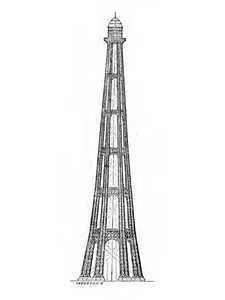 We are there on a 1300-foot-tall, cruciform-shaped tower, which is rather original. Its foundations, at the widest, are 500 feet. 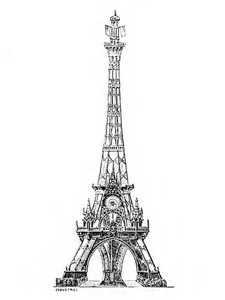 It would be made of steel, cast iron, Portland stone, glass and zinc. Its estimated cost is £ 500,000. The ground level contains a large, 100-foot-high hallway around which a 30-foot-wide, 1-by-15 slope ramp runs. This plan leads to a 2-acre gallery. 100 feet in height. This hall can hold 400 people. There are 10 lifts and two special lifts to accommodate various loads, but also horses. Designers: Llewelyn Campbell, 26 Budge Row, Cannon Street, London. We are there in an extremely tall tower, 1670 feet high (550m). Its base would have made 275,625 square feet. At a cost of 1,300,000 pounds all inclusive, it would also have been one of the most expensive. It was planned in metal, steel exactly. This tower is perfectly adapted, according to its designer, to the fields of education and entertainment. It has large free and empty spaces to accommodate what the builder wants, with the exception of spaces for elevators and stairs. One could consider a concert hall, a circus, etc. Designers: J. Tertius Wood, Rochdale. This tower has just the imposed height, 1225 feet. It is circular in shape with a diameter of 450 feet. Its weight is 12000 tons, it would be made of steel. 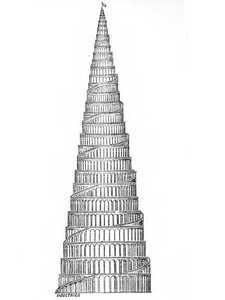 With elevators placed at the center of the tower, its cylindrical plan allows only oscillating forces to be processed. This form also gives a low hold to the wind. This tower is actually a series of domes. The lowest is covered with a glass roof, which allows to have a winter garden. A spiral gallery allows visitors to circulate, possibly with pulling animals. 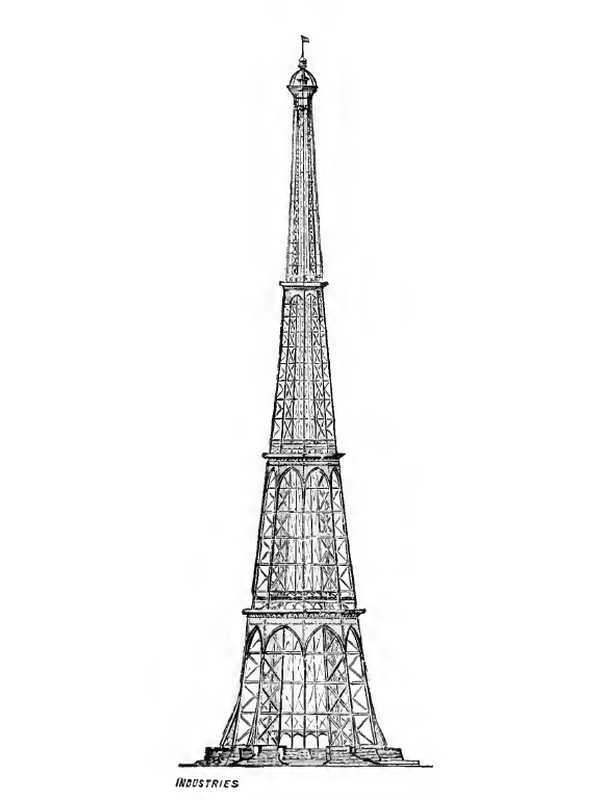 This tower would have been lit with electricity, if it had been built. Designers: Philip Masey, Hope Villa, Harold Street, Loughborough Road, London. It is a tower 1400 feet high with a base of 325 square feet. 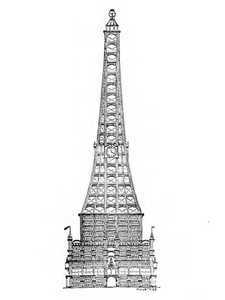 It was planned in cast iron and glass at a low cost of 130,000 pounds. The architectural style is that of ancient Rome 2000 years ago. 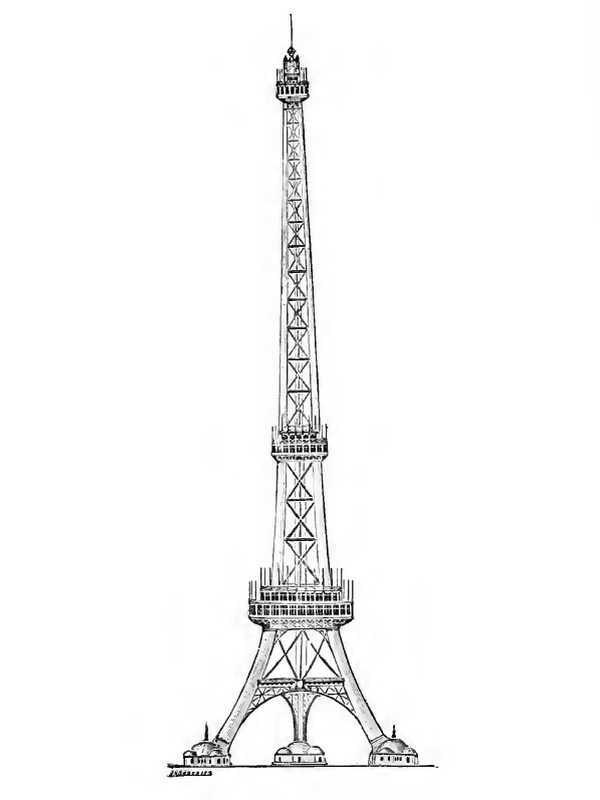 This tower could be mounted in 9 months, according to its designer. Made of cast iron instead of steel, it would be more economical. It would have 24 floors, made of cement and steel. The foundations would be given special attention, with a thickness of 10 feet minimum. The smallest diameter would be 75 feet. We could make an exhibition hall, restaurants, shops, hotels, etc. She could have 3 lifts. A quick calculation indicates that we could build 400 rooms at 25 pounds, for an annual yield of 10,000 pounds. 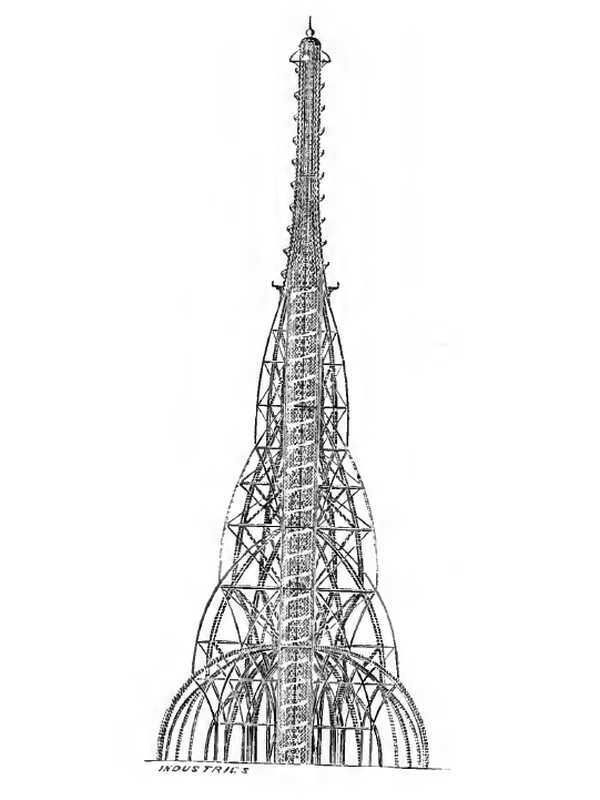 Designers: Neloah, 224 Stockwell Road, London, SW This proposed tower is 1,200 feet, but there is little other information about it and it can be considered that it was immediately removed from the competition, for lack of visibility its real cost and its technical constraints. Designers: C. Findlay, W. Rendel and Halsey Ricardo, 8 Great George Street, Westminster, S.W. 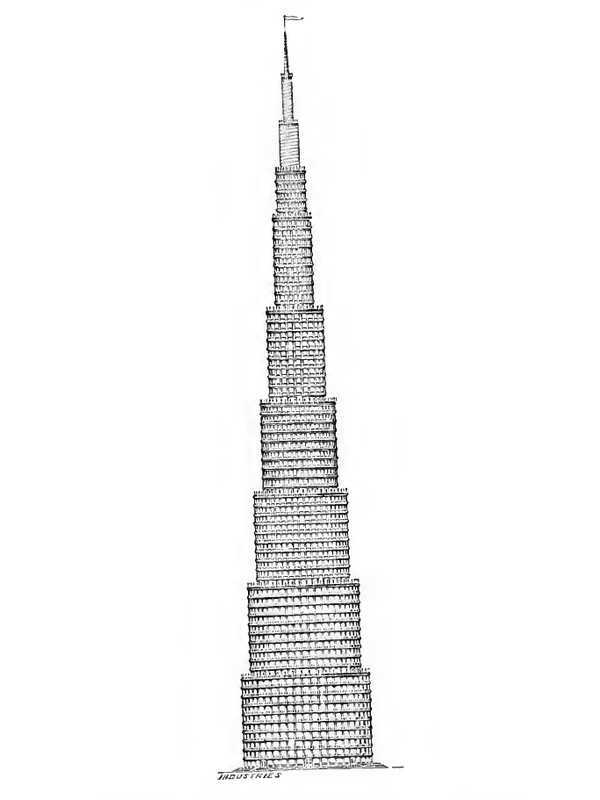 This tower is 1,200 feet tall and weighs 3,256 tonnes, one of the lightest in this competition. It had been planned in steel but had to contain cast iron parts. Its cost was estimated at the time at 155,080 pounds. 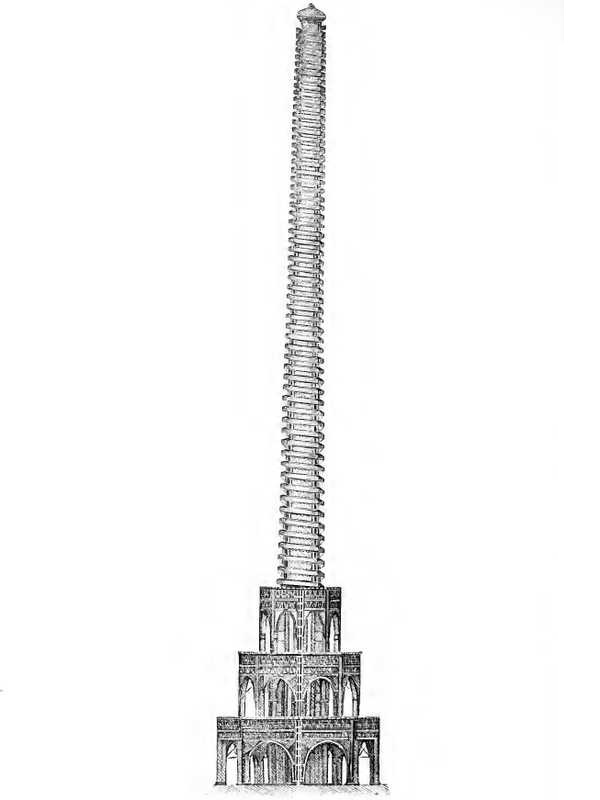 This tower is in fact a central pole held vertically by metal ropes. Balconies serve as a promenade area. There would have been at 400 feet of restaurant restaurants, likewise at 600 feet. These balconies would have been reached by hydraulic lifts inside the mast. The interest of this tower is its low cost, both in construction and maintenance. To dismantle the tower it was planned only 6 weeks of work, in case of necessity. It is also an argument in favor of this construction. Designers: Theodore Sington, Dickenson Street, Manchester. This tower is 1200m high, a square base of 215 square feet and a top of 50 square feet. Its weight is estimated at 9,250 tons and its cost at 330,000 pounds. It had to be made of steel. 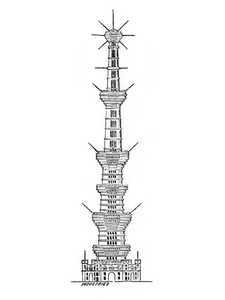 This form was inspired by the Atech-Gah tower in Firuzabad. There are also inclined balconies and elevators. 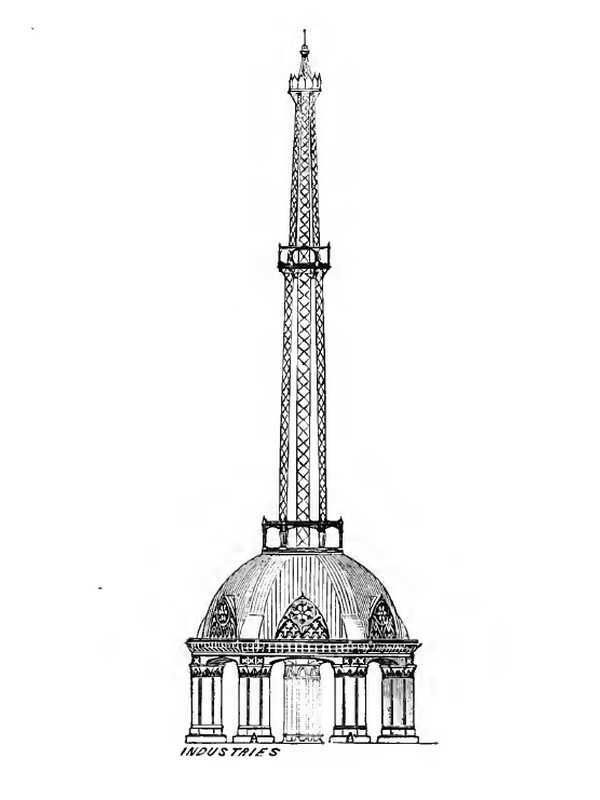 This tower was to be illuminated by electricity. Designers: Robert Wylie, 6 Lord Street, Liverpool. This tower was to be 1470 feet high and have a stone seat masked by granite slabs. Inside, there would have been a closed area of ​​40,000 square feet. 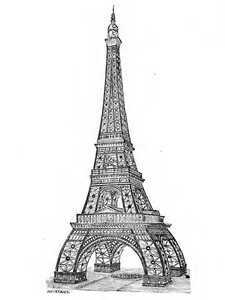 Its weight was estimated at 10,260 tons and should have been made of steel. It has been estimated at 330,000 pounds, for its manufacture. The masonry base of this tower was to accommodate tennis courts and all that is needed to practice this sport, restaurants, etc. The first floor would have been 344 feet above the ground, there would have been a promenade gallery. On this floor would have been the main pavilion on two levels, the level above being to be a concert hall. The third floor is the highest pavilion, it would have had an external gallery. This pavilion was also divided into two levels: Downstairs, bars and restaurants and at the top a room of floral exhibitions. The 5th level is interior only (1010 feet) and the 6th is 1348 feet, it is surmounted by a gallery. The dome then begins, it contains the last floor at 1400 feet in height. 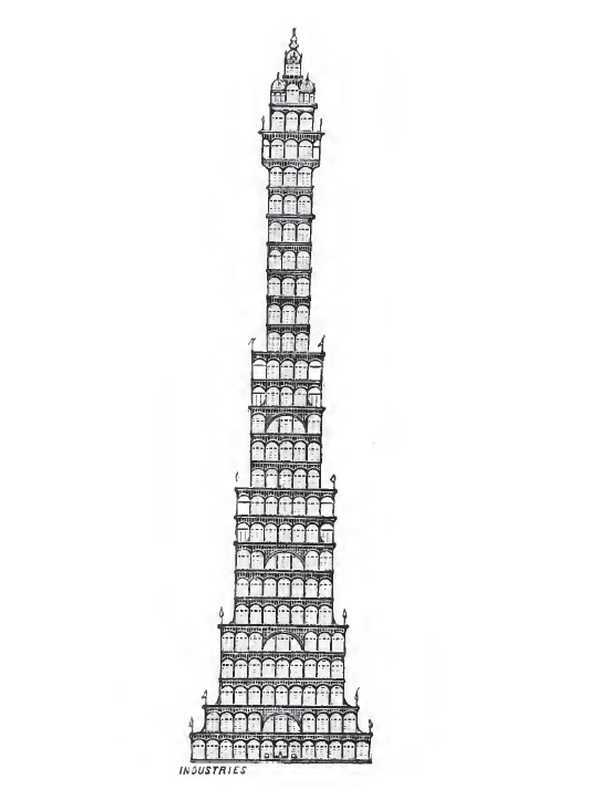 The complex would have been served by 4 hydraulic lifts, 4 stairs serving in addition to the floral floor from which two other stairs would be mounted at the top. The lighting would have been electric. Designers: Walford and Wormald, 110 Buckingham Palace Road, London. This is an original tower mixing Gothic tyle and metallic architecture. 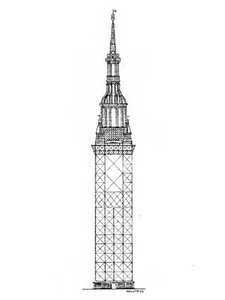 At a height of 1300 feet for a square base of 33 000 square feet of floor space, it was to have a weight of 7890 tons and be made of steel and cast iron. Its cost was estimated at 279,121 pounds. 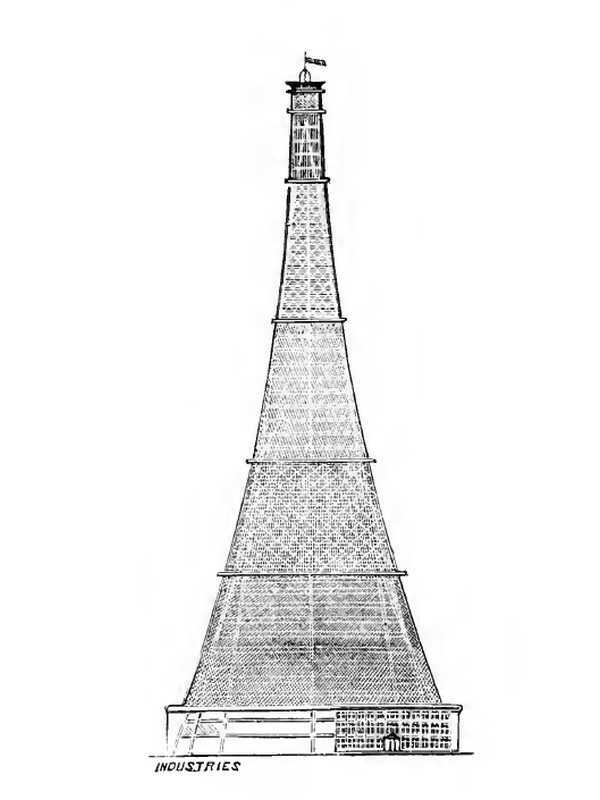 This tower consists of 4 floors main branches, one at each corner of the building, containing the basement, the ground level, and 5 floors, the highest being 1000 feet from the ground. 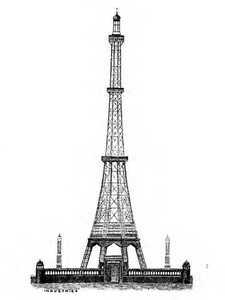 The basement would have been used for the machineries, as it is the case for the Eiffel tower. The ground floor is a 33,000 square foot winter garden, plus various other possible uses of this space. The first floor is 200 feet high and measures 9,000 square feet in area. This space could be used in different ways, for example by hosting a theater, restaurants, etc. The grand floor at 1000 feet tall is more than 10,000 square feet, this is the point of arrival of the elevators. Outside there would have been a gallery, and above it a lantern. The stairs would have been different between the ascent and the descent. Designers: Ewen Harper, J. Harper and John Graham, 57 Colmore Row, Birmingham. 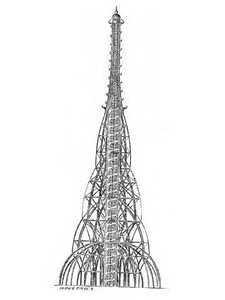 This is a tower 1300 feet high in the shape of a star with 6 branches. Its minimum thickness would have been 400 feet per run weight of 9,264 tonnes, without foundation. It would have been steel and would have cost 247 450 tons. 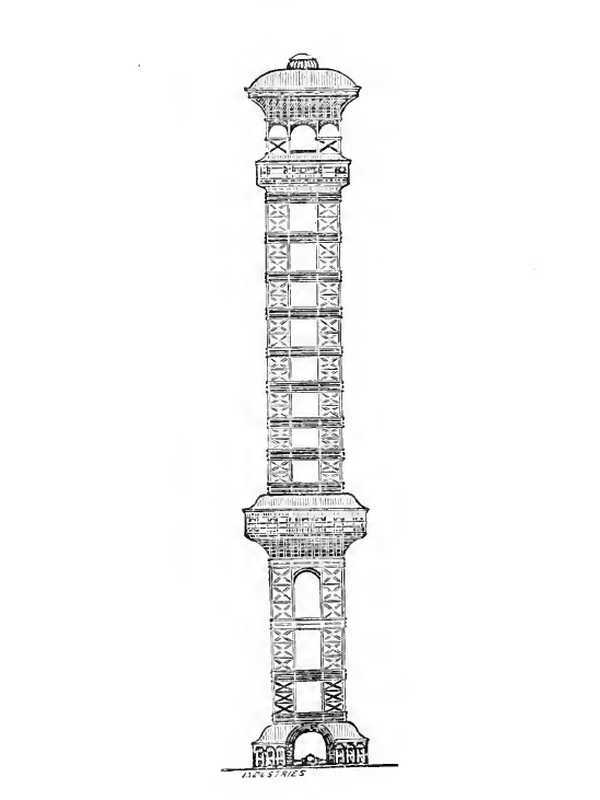 The elevators of this tower would be mounted directly from the center of the tower. 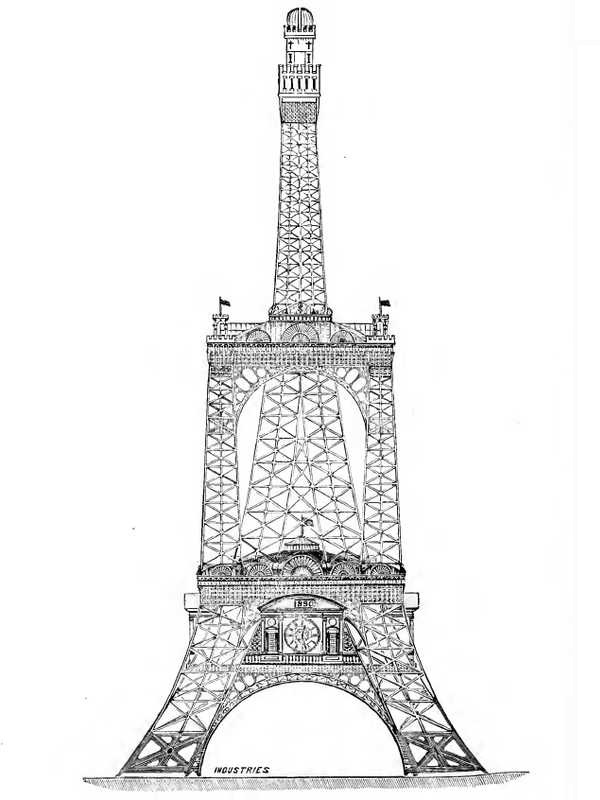 This project is a bit of a copy of the real Eiffel Tower. The strength and savings have been put forward for this successful construction. It was to include 4 floors or platforms defined as: 300 feet in height and 35,000 square feet in area, 500 feet in height and 16,750 square feet in area, 800 feet in height and 4,250 square feet in area and 1,200 feet in height for 3780 square feet of surface. The elevators had to run on hydro, but it was the electricity that had to take care of the lighting. Designers: Wyndham Vaughan and William Tomkins, 64 bread street avenue, London. 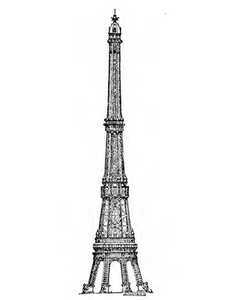 This tall tower would have been 1500 feet high. Its diameter, at the base, would have been 500 feet, this diameter decreasing to the top. Made of steel it would have weighed 16,747 tons. The cost has not been calculated. 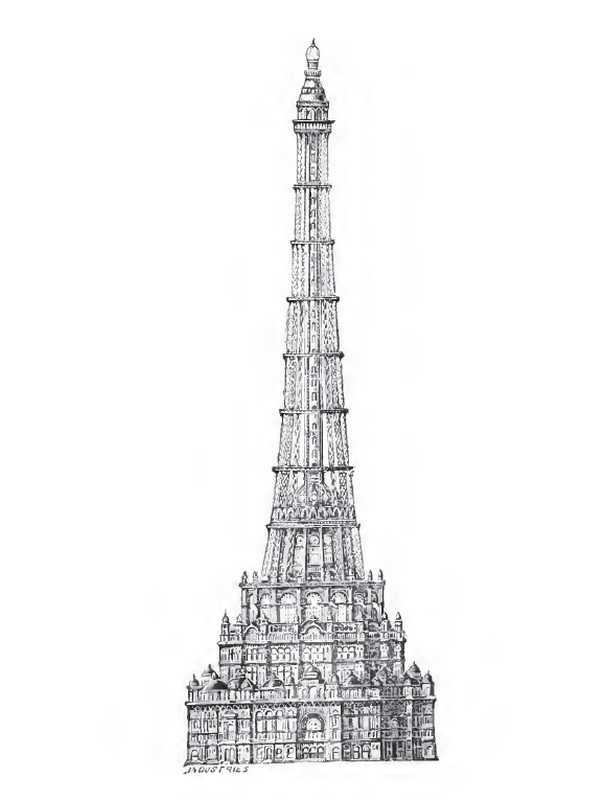 The skeleton of this tower is octagonal, consisting of 8 triangular pillars, each of 3 tubes. There would have been 3 levels at 216 feet (for a space of 90,746 square feet), 432 feet (for 31,400 square feet) and 1360 feet (for 11,309 square feet). There would also have been a floor at the top, in the campanile, with a small balcony all around the lantern. Stairs and steam lifts were planned. 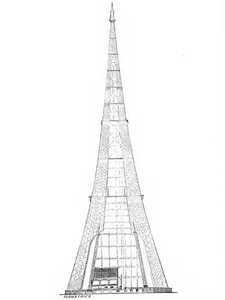 Designers: Max Am Ende, Victoria Street 5, SW This tower is planned to be 1550 feet tall, so be of a very large size. On a square base, it was to be constructed of steel and weigh 16 053 tons, of which 10 848 tonnes for the structure itself and 2,617 tonnes for the platforms. Its cost is estimated at 674,592 pounds, including foundations. 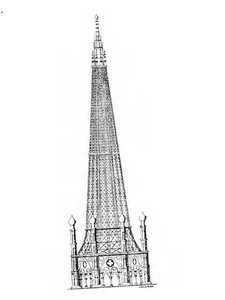 This tower has a Gothic appearance, it would have been in phase with the Tower Bridge. Equipped with 5 platforms, at 1320 feet, 1200, 1000, 780 and 400 feet from the ground. It had to be a showcase of the metallurgical industry of the United Kingdom. All his pieces were supposed to be very fine, without the use of iron. The platform at 1000 feet would have been the widest, with an outside balcony, stairs and elevators. 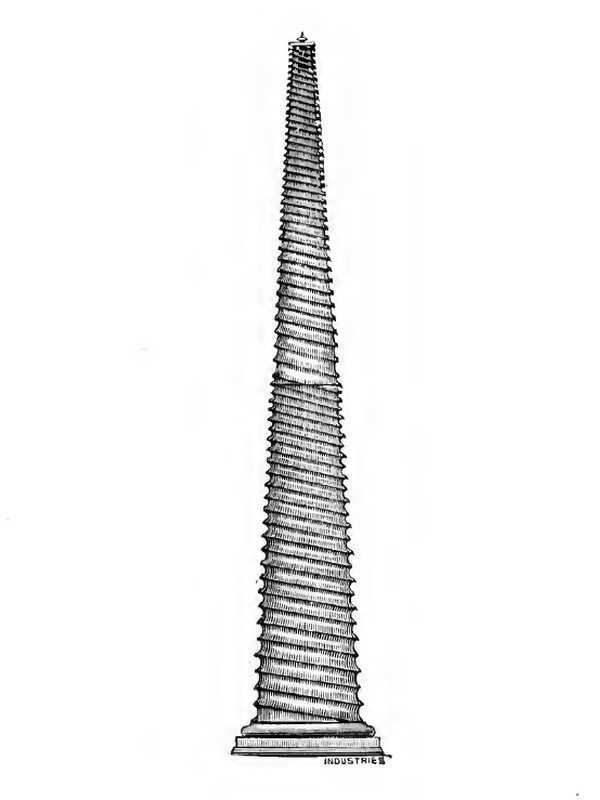 An elevation system consisted of a spiral railway running on steam. The diameter of the spiral was a little over 21 feet, the slope of 1/5. There would have been between 8 and 40 freight cars. Each car was equipped with 10 1st class, 11 2nd class and 12 3rd class seats. The lighting would have been electric. Designers: The John J. Webster MICE Tower and T. W. Haigh. 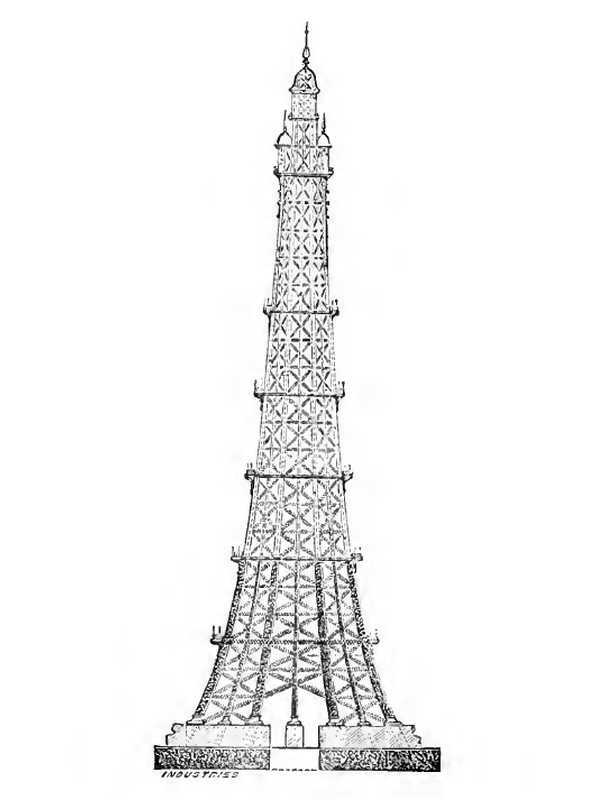 With a planned size of 1300 feet and a weight of 8820 tons, this tower is also octagonal, made of steel. Its cost is supposed to be 399,638 pounds. The octagonal shape of this tower has been chosen to get as close to the circle as possible, which reduces the wind force to a minimum. The stability of the structure is uniform for all directions of the wind, suddenly. It occupies a minimal space on the ground, and is economical to build. The height of the 1st platform is 200 feet; 2nd, 500 feet; 3rd, 750 feet; the 4, 1215 feet; the Lantern Gallery, 1250 feet; and the top of the crown, 1300 feet. The building is suitable for hosting hotels, restaurants, residential apartments, offices, warehouses, shops, concert halls and other entertainment. 3,000 people can comfortably sit on the 1st platform while leaving a wide walk around the seats. In addition to the ski lifts, access to all platforms and floors in the buildings can be done by a staircase leading to the 4th floor. There is also a spiral balcony, which allows you to climb gradually. The lower lengths of the vertical columns are filled with ballast in order to obtain the necessary stability in the most economical way. The lighting is electric. The rents should ensure a nice dividend for an initial total expenditure of £ 450,000. Designers: W. Rendel, C. Findlay, and Halsey Ricardo. Its size was planned poru 1260 feet, with an octagonal shape occupying 46000 square feet on the ground. 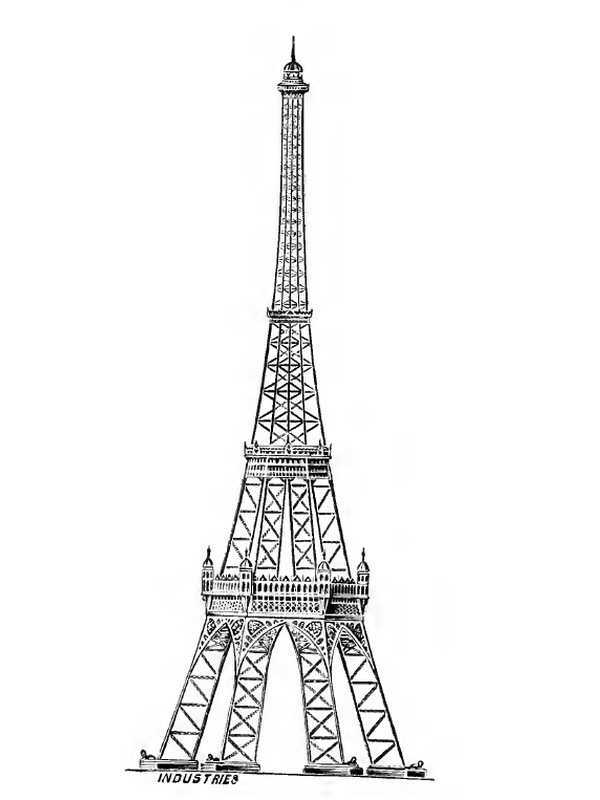 Built of steel, it would have weighed 9,628 tons of steel and 850 tons of iron for a price of 388,500 pounds. 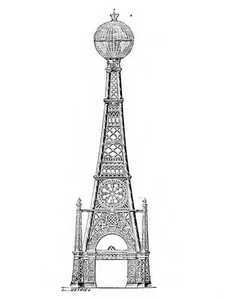 The base of this tower is a winter garden with a domed roof, and a floor area of ​​46,000 square feet. She has a walk around the dome located at a height of 25 feet from the ground, under which lies another promenade lined with shops, restaurants, etc. The lifts transport passengers to the first floor, which is 304 feet above the ground, and contains an area of ​​16,240 square feet. The remaining height is divided in two by a gallery, 712 feet above the ground, containing 5300 square feet. The top lantern floor is accessed by hydraulic elevators inside the hollow octagon forming the tower. 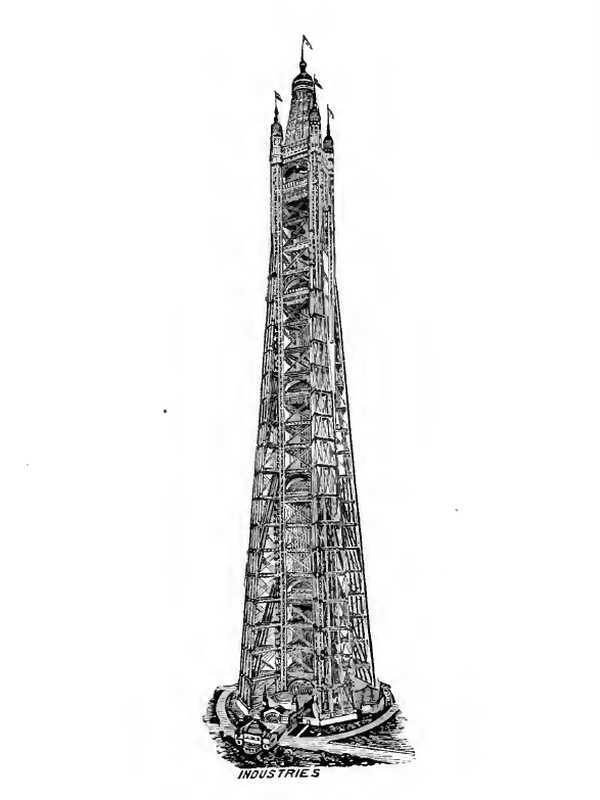 In addition to access by elevators there will be access by a spiral incline that descends from the summit to the outside of the Tower, which is about a mile and a half in length, with a gradient of 1 to 8. The lighting of the tower uses electricity. Designers: Francis Fox and George Grayson, 31 James Street, Liverpool. 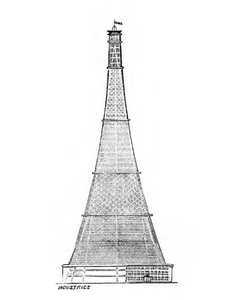 This tower was to be 1300 feet long and was shaped like double octagons, one size, at the base, of 370 feet. 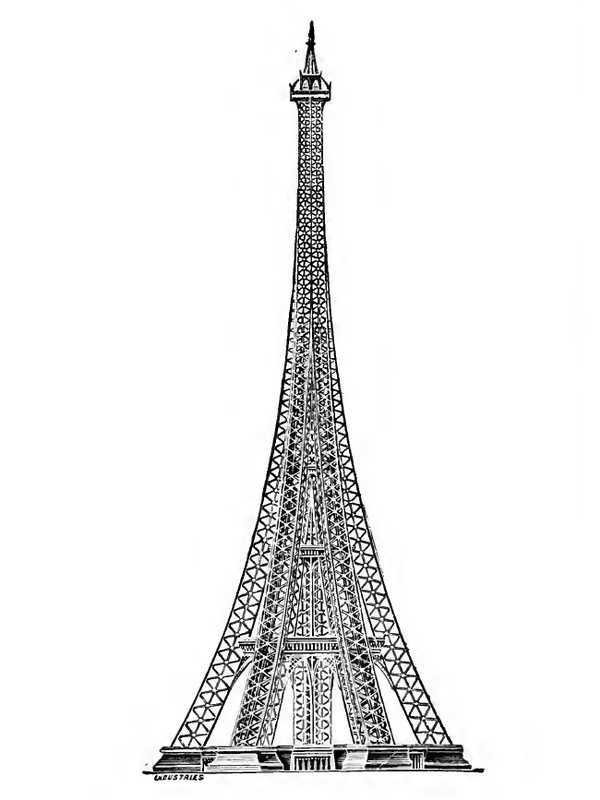 Its weight is 10,200 tons, which is comparable to the Eiffel Tower. It had to be made of steel. Its cost should have been around £ 300,000. The main skeleton of this tower consists of 16 columns, supporting several frames, each of 20 square feet. The upper platform has a diameter of 50 feet at an altitude of 1,200 feet. There are 6 galleries. An inclined spiral floor is provided at the first floor gallery. Elevators are available. The design combines stability and economy. 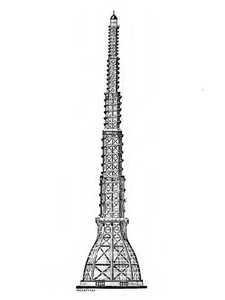 The curve of the tower of the rise of ground is parabolic, which is the most logical form to have a good resistance to the pressure of the wind. The design thus offers the least possible resistance to wind, so that the resulting force due to the weight of the structure falls into the base. This tower contains a concert hall, a sanatorium, and a number of rooms above the fifth platform. It is lit with electricity. Designers: J. Sinclair Fairfax, 433 Strand, London. The tower is 1296 feet high, and 576 feet wide, at the base. It is relatively heavy since it was supposed to have a weight of 34,200 tons. It is provided in steel. There is a lighted and open space in this 96-square-foot tower, which extends from the ground up to a height of 840 feet above, where it is engaged for 16 square feet. Therefore, it is possible to swing a pendulum freely from a fixed point 1296 feet above the ground. There are 10 floors above the ground. Steam lifts and stairs are provided. This tower has been designed to accommodate a large number of people up to high levels of 840 and 960 feet above the ground. Lighting is provided by electricity. Designers: Henry Davey, 3 princess street, Westminster. 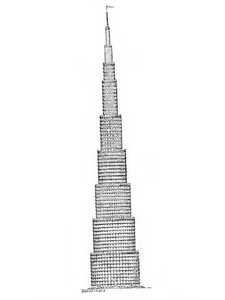 This tower measures 1250 feet tall, a little more than what is planned by the contest. It weighs 8000 tons and it is made of metal, steel, exactly. Its cost has been estimated at £ 221,000. The skeleton consists of 12 main tubes joined together by a masonry of 4000 tons, to be added to 8000 tons which concern only the metal superstructure. The base is a winter garden. There are stairs, but also hydraulic lifts. The structure takes the form of a spiral above the first floor, which is at a height of 380 feet. The ground level is made of a winter garden so it occupies an area of 70000 square feet. There are two floors, one at 380 feet from the ground, the other at 980 feet. On the first floor there are 3 levels, which gives a space of 14000 square feet. The summit is accessible by a staircase, we are then at 1250 feet from the ground. Designers: W. Hemingway, 9 Cawood Terr., Dawes Road, Walham Green, London. It is a 1200-foot hexagonal tower, becoming triangular at its summit. The estimated weight is 29 891 tonnes, making it one of the heaviest on offer. It is made of steel and iron. His cost is estimated at 400,554 pounds. Simplicity of construction and ease of erection. The triangular shape of the top offers the minimum resistance to wind pressure. This tower can be used as a concert hall, banquets, etc. Designers: R. Read and L. Shuffrey, 38 Welbeck Street, London. This tower is supposed to be 1250 feet tall with an octagonal base. Its weight is 7600 tons, for the metal part. 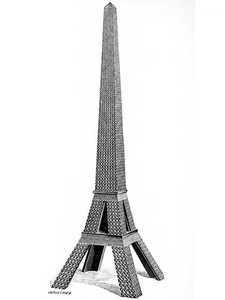 (It's steel) Its cost is estimated at 390 673 pounds. 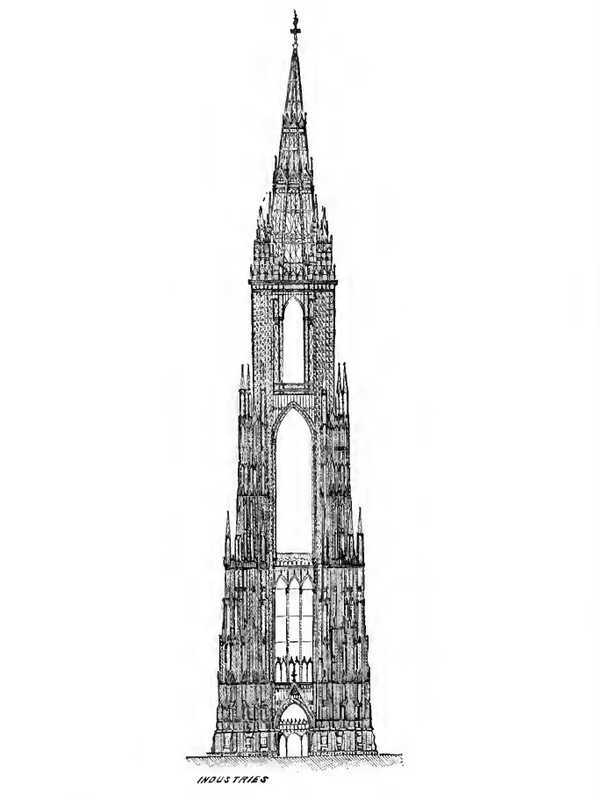 This tower is based on 16 pillars forming the legs, laid on granite bases. The main floors are at 2 levels, one at 200 feet, the other at 800 feet from the ground. On the lowest floor there will be pavilions containing restaurants, cafes, concert halls, dance halls, kiosks, etc. The other floor will contain other pavilions reserved for similar use. There will be a gallery above the 2nd floor. In total this tower will have 4 platforms equipped with hydraulic lifts. It will be lit with electricity. Designers: Henry Law and Sons, 9 Victoria Rooms, Victoria Street, London. This quite original tower is very high, it measures 1475 feet, or 442m. Its hexagonal base is 225,880 square feet for a total weight of 14,210 tons of steel and 2,200 tons of iron. Its cost is estimated at 726,752 pounds, one of the most expensive on this list. The general shape of this tower is centered on a hexagonal base supported by 6 curved pillars. At ground level there is a main lobby, restaurant and concert hall, covering 6880 square feet, as well as a 68,500 square foot terrace. The first floor is 86,780 square feet, the second floor is 41,800 and the third is 11,500. Finally, the fourth floor is 8,240 square feet. There will be elevators and stairs. The lifts, moved by a hydraulic system, are in the center of the structure, in a separate space in 6 modular triangles. The elevator speed is 360 feet per minute. Designers: R. Smith and W. Henman, 124 Hoakley Road, Birmimgham and 38 Bennettes Hill, Birmimgham. This tower of 1400 feet, has a triangular base, which is an originality. 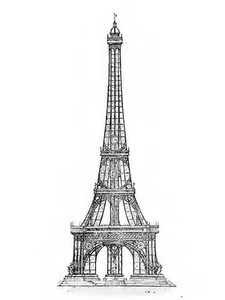 It is made of steel and iron and weighs 11,502 tons. Its estimated cost is 229,500 pounds. 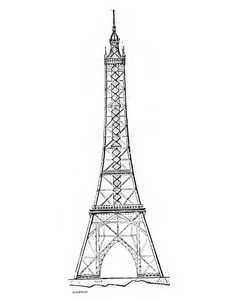 This tower consists of 3 steel tubes arranged in equilateral triangle. On the ground the tubes are 30 feet in diameter, they are 350 feet apart. The first gallery is 156 feet high, measuring 12 feet by 500. The continuation of the elevation consists of a large platform with 3 floors and a mezzanine for a total of 12,582 square feet of area. This floor is 585 feet in height. There is also a platform above 12 50 feet with an area of 4,075 square feet. The structure ends with a crown. There will be elevators and stairs. Designers: H. Sketchley, Gwendwr Road, West Kensington. At 1264 feet high, it has a square base and weighs 12,000 tons. It is constructed of steel and is expected to cost 193,263 pounds of labor and 496,154 pounds of material. This tower is in two parts, it is one of the most original. 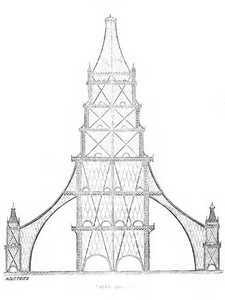 The upper part is made on an octagonal base of which each pillar is placed on another tower, that of the lower part. This lower part is made of 4 independent towers. The upper part is composed of 16 columns. The first platform is 264 feet above the ground and measures 8,400 square yards. The 2nd platform is 528 feet above the ground, with 3,650 square yards. The 3rd platform is 1048 feet above the ground, it has an octagonal shape and measures a diagonal of 86 feet for 680 square yards. It is surmounted by a 330-square-foot, octagonal-shaped somal platform, itself surmounted by a gallery that could be used for scintifical experiments. There will be elevators and stairs, and like the others this tower will be lit by electricity. Designers: Thomas Plant and James Fleming, 85 Gracechruch Street, London. 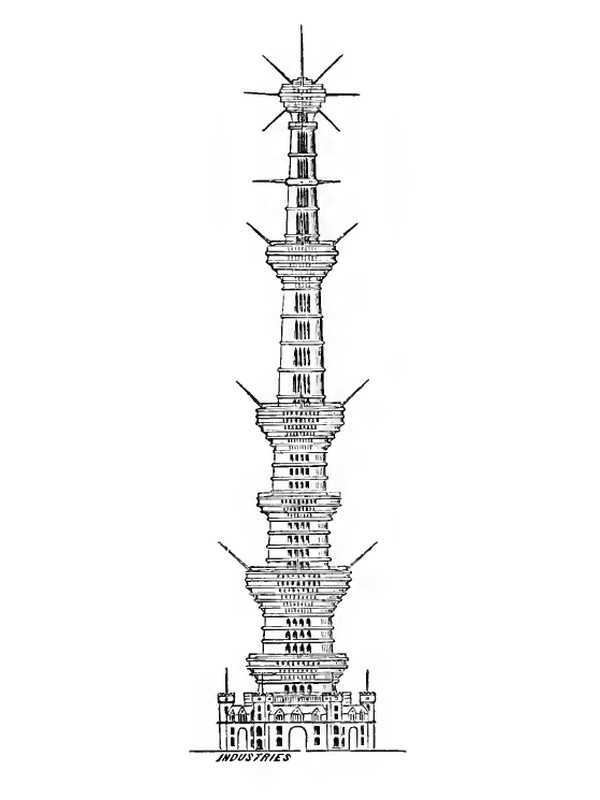 This tower respects all the height imposed by the contest, it is 1,200 feet high. 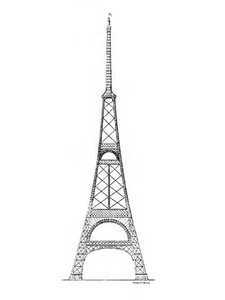 On a triangular base it weighs 6278 tons of steel. It will cost 234,050 pounds, excluding foundations. This tower is nicknamed "The tripod" because it has this shape, which was chosen for its great resistance to wind pressure. There is 320 feet between the ground floor and the feet. There will be elevators and stairs, and like the others this tower will be lit by electricity. Designers: Milne Watt, Wellington street, Glasgow. 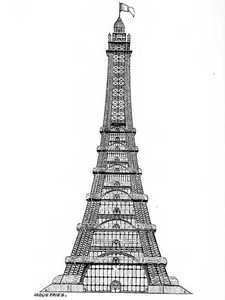 This tower respects all the height imposed by the contest, it is 1,200 feet high. It has an octagonal base and is made of steel. Its cost was not estimated, or it was not provided. This tower consists of 3 pillars per side. The 8 pillars are anchored in the ground, sealed in the foundations. There are different floors. Lighting is provided by electricity. Designers: George Halpin, 22 Belsize Square, London. It is a 1250-foot high construction on a square base, for a weight of 6000 tons, which is low. The material used is steel. Its price is very low, it is 114 450 pounds, including foundations. 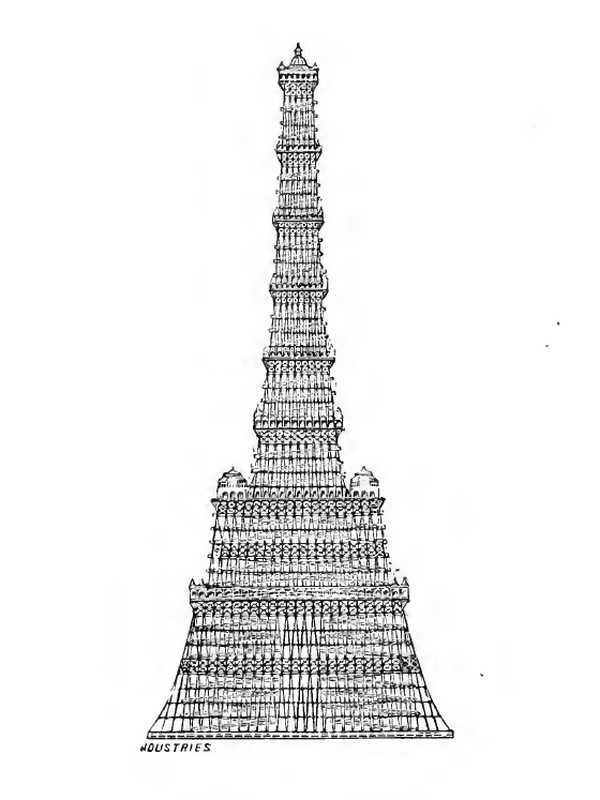 This tower contains two floors at the base of the lantern, so at the top. The lowest is 1200 feet, the highest is reserved for scientists. Further down is a platform 900 feet above the ground, and other platforms at elevations 630, 550, 310 and 165 feet. There will be elevators and stairs. Designers: Lamont Young, Villa Lucia, Naples. This tower is 1450 feet high, so it is very large. It has a square base and weighs 23,000 tons, not counting elevators, internal partitions and other accessories. It is made of iron, but its cost has not been estimated. 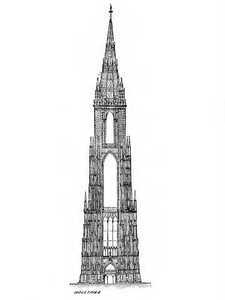 The general form of this construction is made of 5 independent towers, an important main tower supporting a terrestrial globe and 4 much smaller ones, placed at the 4 corners. It is the large space under the globe that will be the main attraction of this tower. The largest platform will be at the top, which is original. The central part is square, it will be accessible by lifts and stairs. The globe will consist of 7 different levels containing shops, restaurants, reading rooms, museum spaces, etc. The lighting will be electricity. Designers: Edwin Roundtour, 18 Colquhoun Square, Helensburgh, NB. We are dealing here with a tower of 1236 feet exactly hexagonal base and circular elevation. She is eating 13,935 tons. It is planned in steel but has not been estimated. This tower will have a big impact on its foundations. The circular shape has been adopted to have minimal wind resistance. It must be considered as a large tree with foundations firmly anchored in the ground. It is completely closed so that visitors are always safe. It has 4 main floors at 300, 600, 900 and 1200 feet. On the roof there is a gallery, one is at 1236 feet from the ground. There are, of course, stairs and lifts. Designers: W. Fawcette, 48 Lowther Street, Crown Street, Liverpool. This tower is very high, it is 1500 feet high. It has a square base and is made of steel and iron. Its weight has not been estimated, nor its cost. Designers: James Maxwell, 4 Upper Coltbridge Terrace, Edimburgh. The planned height is 1333 feet. Like the previous one, we have neither its weight nor the estimate of its cost. It is hexagonal. Designers: W. Breithaupt, 309 and 310, Baird Building, Wyandotte and Sixth Streets, Kansas City. This tower is 1200 feet high on a hexagonal base. 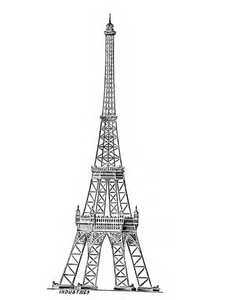 Its weight, made of steel and iron, is 6250 tons. It will cost 108,129 pounds, according to the manufacturer, if it were actually made. On the first floor of this tower is a concert hall of 1350 seats, with possible extension to 900 places in the gallery. There will be a promenade gallery above which there is a restaurant. At the top of this floor will be the storage of the kitchens and the kitchens themselves. The 2nd floor will be a hotel and spaces dedicated to this kind of service. The 3rd floor will be used for meteorological observations. All the interior will be fireproof, made of copper foil.